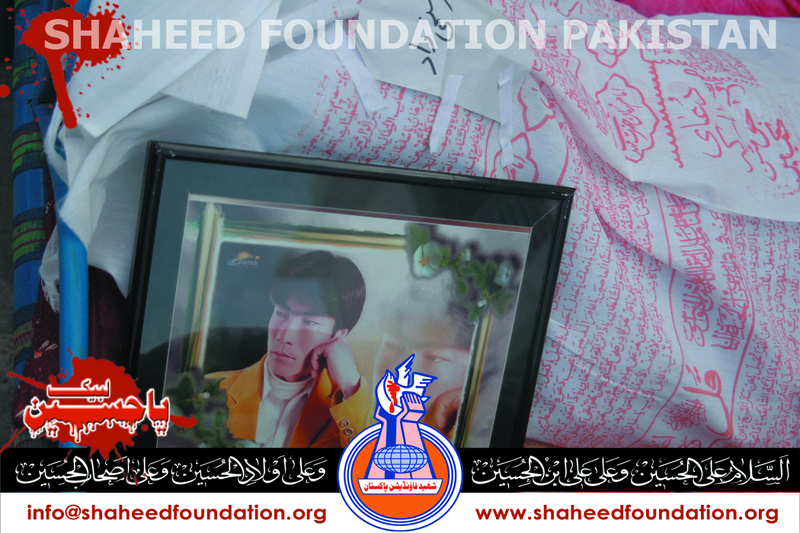 Please recite a Fateha for Shohada-e-Saneha-e-Kirani Road [Hazara Town Quetta] ,Shohada-e-Alamdar Road and All other Shohada-e-Millat-e-Jaffaria Pakistan. Abdul Rasheed ,45, an injured victim of the gruesome Kirani Road tragedy of Quetta ,succumbed to his injuries and embraced shahadat He was being treated at a local private hospital in Karachi . 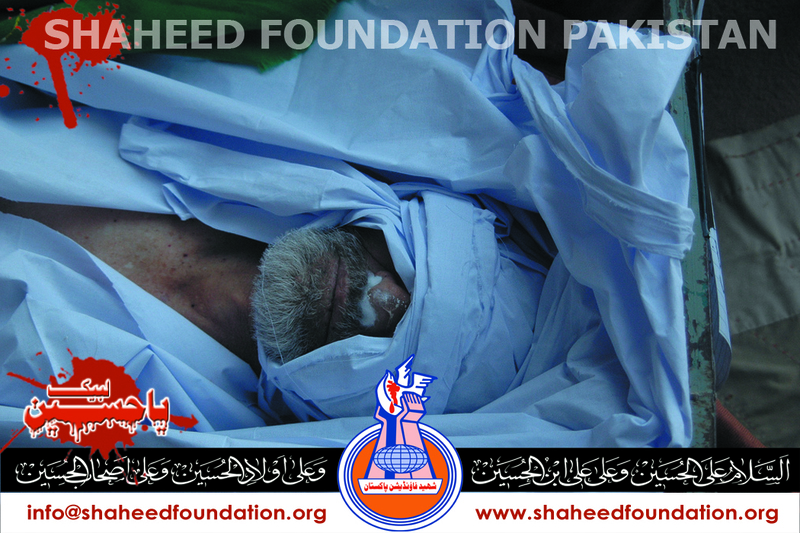 His body was scheduled to be shifted to Quetta. It may be noted that around 30 injured victims of Kirani Road tragedy were brought to a local hospital in Karachi for better treatment under an agreement signed between elders of Millat-e-Jaffaria Pakistan and a six member parliamentary committee comprising government officials . 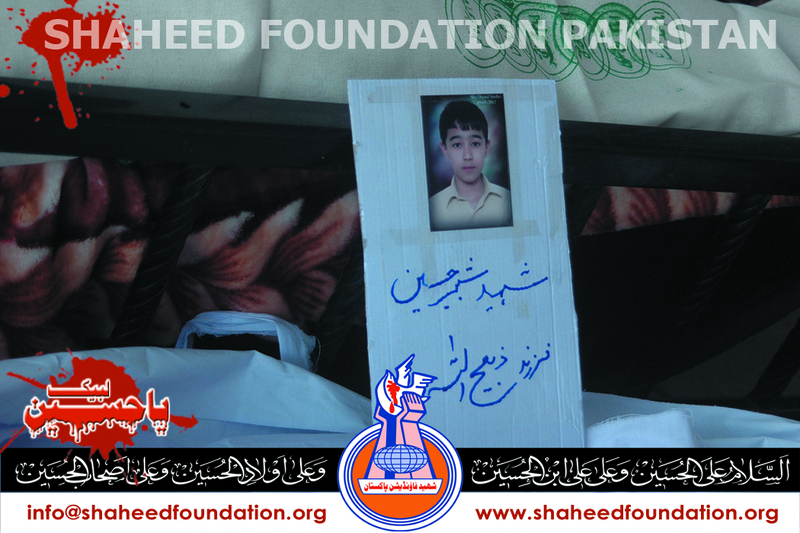 Please recite a fateha for Shohada-e-Millat-e-Jaffaria Pakistan ,hence the number of identified Shohada of this tragedy has now raised to eighty and at least another three dozens are still missing and believed to have been martyred as unidentifed pieces of limbs present a sad commentary on the deepest melancholic aspect of the tragedy . Some DNA samples had been sent to Islamabad earlier for ascertaining the identity of the remaining victims of the tragedy. Gul Afshan a lady victim of the gruesome Kirani Road tragedy of Quetta ,succumbed to her injuries and embraced shahadat while beingh shifted to Karachi. 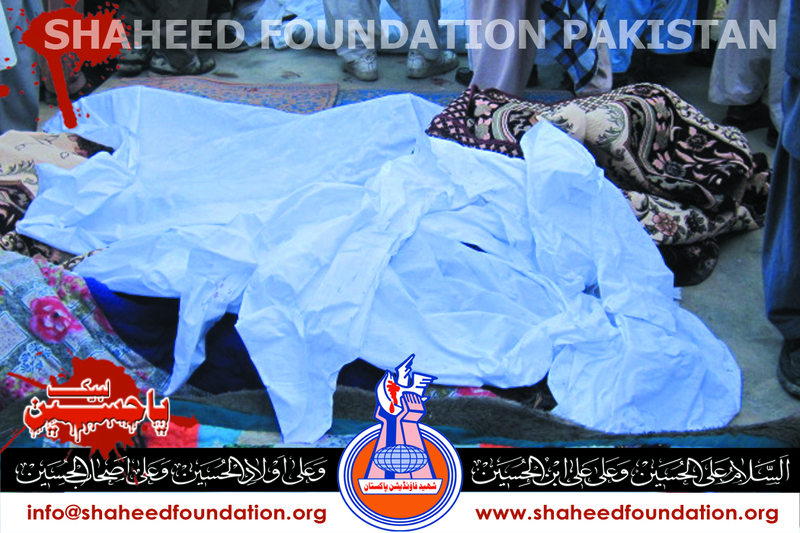 Her body has been shifted to Quetta. It may be noted that around 30 injured victims of Kirani Road tragedy were brought to a local hospital in Karachi for better treatment under an agreement signed between elders of Millat-e-Jaffaria Pakistan and a six member parliamentary committee comprising government officials . 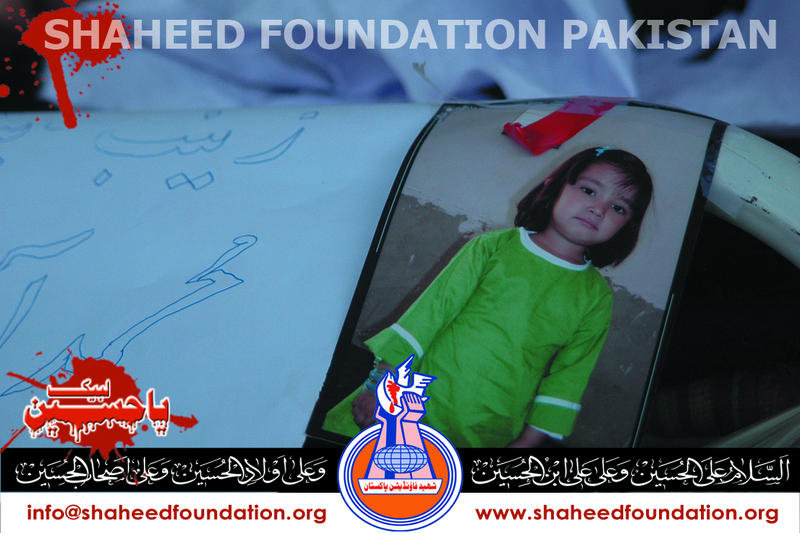 Please recite a fateha for Shohada-e-Millat-e-Jaffaria Pakistan ,hence the number of identified Shohada of this tragedy has now raised to 79 and at least another three dozens are still missing and believed to have been martyred as unidentifed pieces of limbs present a sad commentary on the deepest melancholic aspect of the tragedy . Some DNA samples have also been sent to Islamabad for ascertaining the identity of the remaining victims of the tragedy. 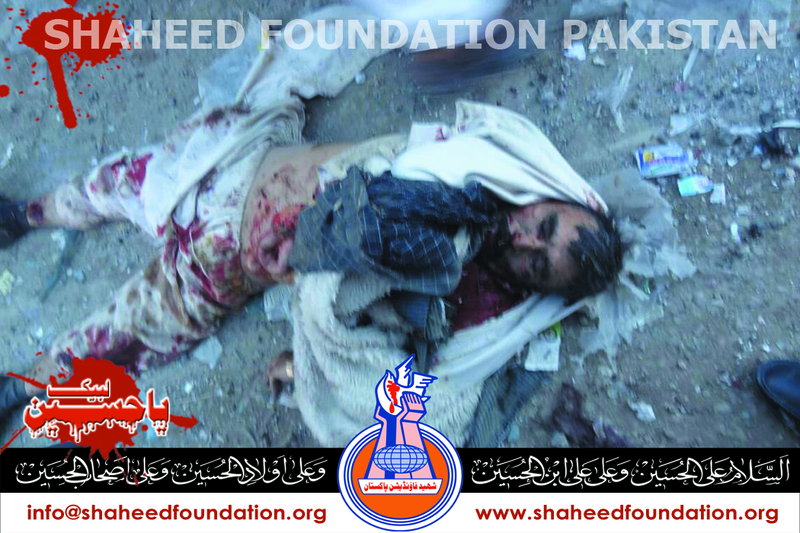 Blood of Shohada stamped yet another historical victory as it remarkably helped unmask various shades of liberal fascist and ethno-political yazidiat in Pakistan in a very short duration . Although the takfiri yazidiat , their patrons and official collaborators in all organs of the state ,had always been recognized by momineen , the liberal ,secular and largely ethnic outlook wearing yazidiat was relatively difficult to identify . Not anymore however. Of course the results achieved as a result of negotiations may not be ideal but it is equally important to know that in such a hopeless situation ,it was a bit too optimistic of us to put forth any demands in the first place . We have the solution already provided by Masoomeen [AS] in their duas which they advised to us and we must contemplate on them hard . Allaahumma Innee Narghabu Ilaika Fi Daulatil Karim,Tuizzo Bihal Islam wa Ahlah, Tuzillo Bihannifaaqa wa Ahlah. 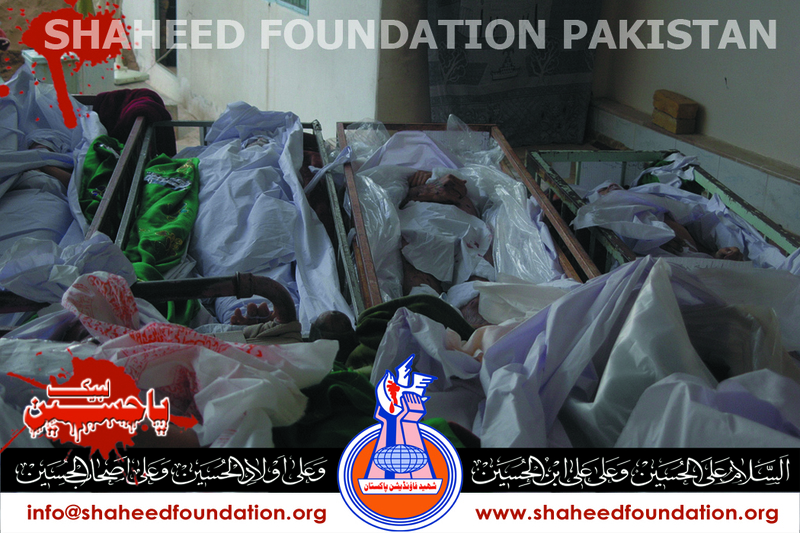 of Khanwada-e-Shohada and Millat-e-Jaffaria Pakistan. Karbala has taught momineen a lesson to always stand up besides oppressed and that is why every one in Millat irrespective of any affiliation and thinking above his views in three contemporary mainstream shia religio-political thoughts , not just whole heartedly participated in all the sit ins right across the length and breadth of Pakistan , but just like all the past occassions there was immense cohesion in momineen belonging to all the three main religio-political and this is not a small development ,it is a giant leap of millat . 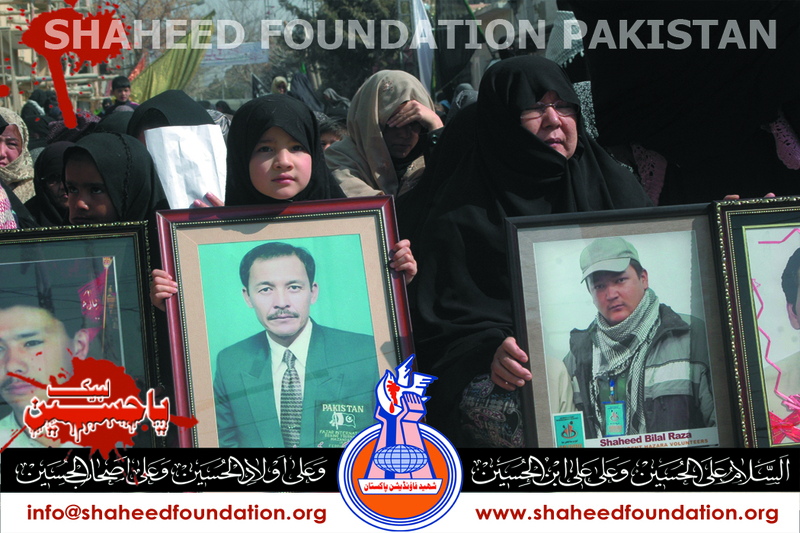 Of course the credit goes only and only and only to the sacred blood of Shohada be theybe they the successful Namoos-e-Risalat rallies, be they the Sit in of Shaheed Askari Raza , the last Quetta Sit in at Alamdar Road , his sit in both at Alamdar Road and Hazara Town and so many of other powerful displays of wisdom ,awareness and absolute cohesion . 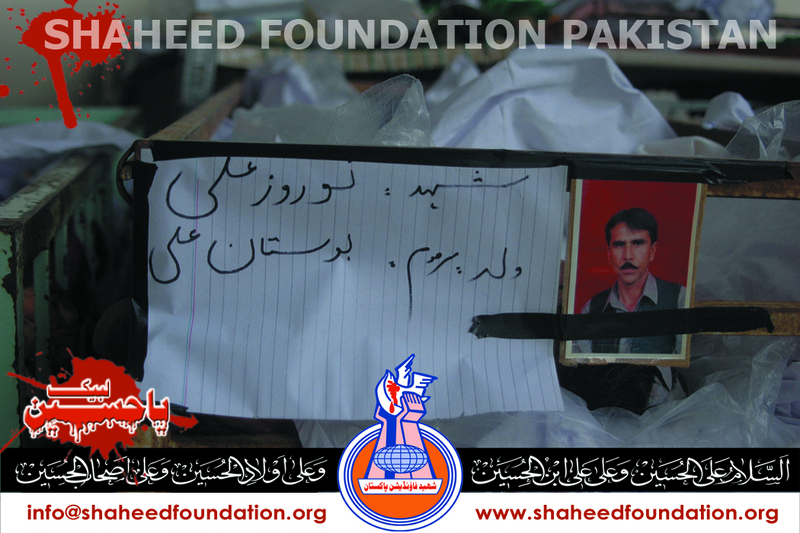 All our hopes must always be pinned only and only on Imam (a.t.f.s) , the sacred blood of martyrs and the resilience of momineen , every one is witness that every single momin and momina was still fresh to sit in for another thousand days in all the sit ins being staged across the country . Finally this is end of the beginnings for us now , this is a start and inshaallaah , we have crossed in leaps journeys of years really anyone who knows of socio-religio-political dynamics of society must know. Never in history ,nations have crossed this much distance in such a short time perhaps. 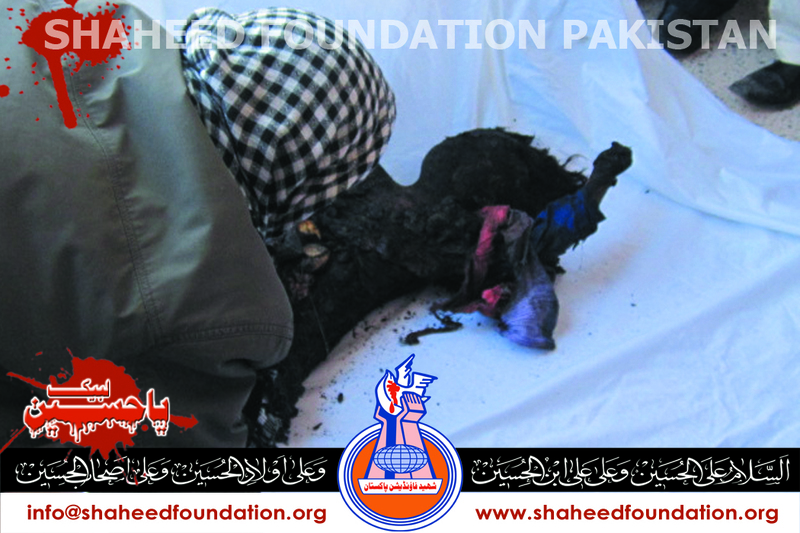 All credit goes to our dearest Shohada. 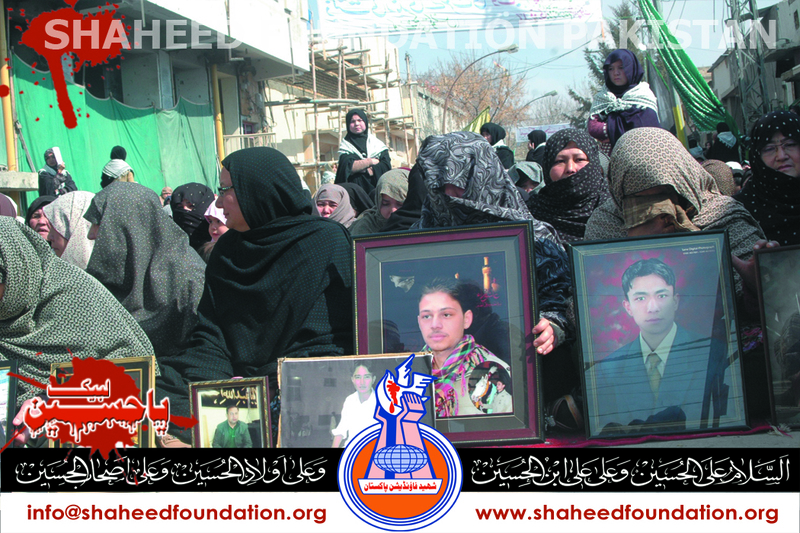 The remembrance of Shohada-e-Quetta must must be kept alive . 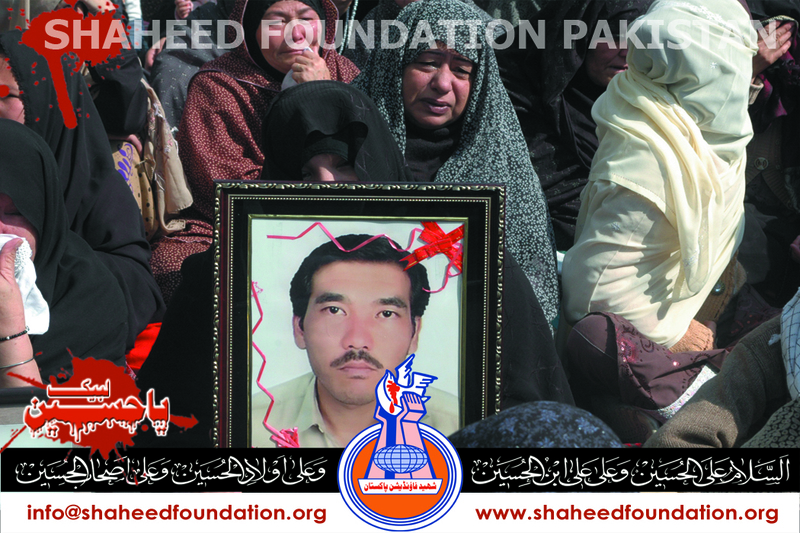 The rememberance of the two young Shohada who laid their lives in saying Labbayk to Call of Shohada must must be kept alive. 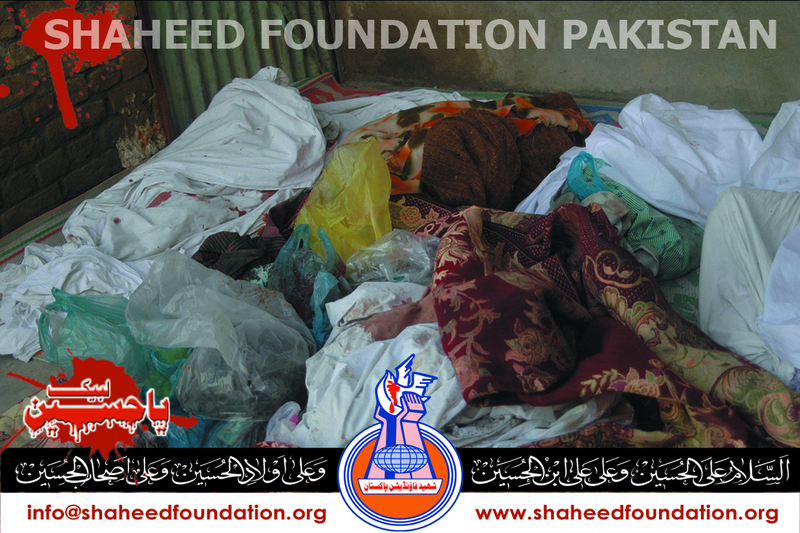 The rememberance of all the Shohada must must be kept alive ,by all of us ,in any any way which we possibly can in our individual and collective capacities ,because this rememberance will give us light ,resilience and maarefat to continue our collective journey towards attaining the pleasure of Allaah [SWT]. 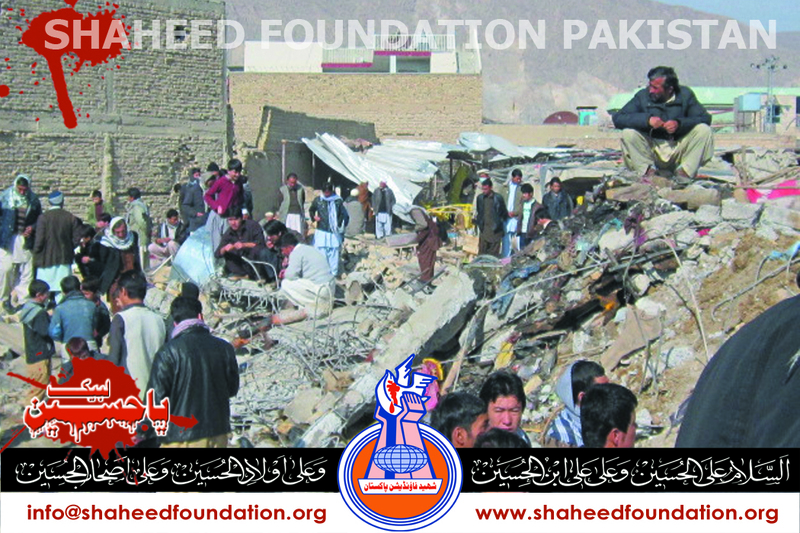 This elevation in awareness level and this display of resilience [ deliberately not saying elevation of resilience for resilience is always there since 1300 years ,the only lacking was awareness ] we must all dedicate it to the sacred blood of Shohada-e-Millat-e-Jaffaria Pakistan ,especially and especially the Shohada of Quetta 's recent tragedies who have really led from the front and have silenced all the critics with their unmatched visible victories even after their Shahadat. 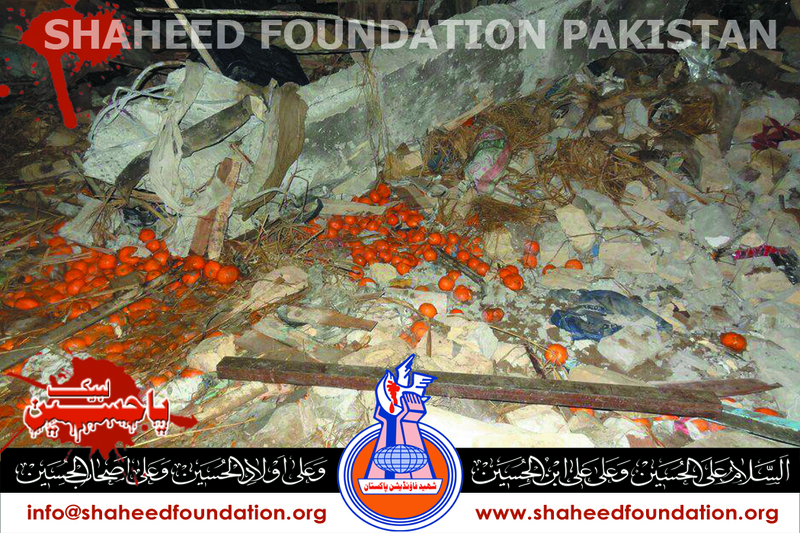 These few are some lucky Shohada really ,the fruits borne by whose sacrifices became evident for every one to see very very quickly . 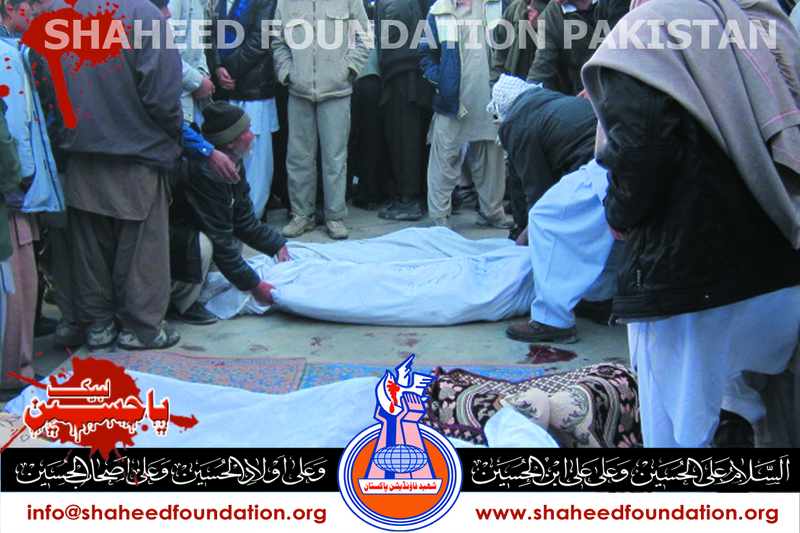 Khanwada-e-Shohada-e-Quetta continue burials at the local cemetery amid tears and cries after the families of Shohada decided to end the sit in in a a lately televised press conference on all national mainstream channel in presence and with consent of Ulema-e-Karaam belonging to a wide cross-section of Shia political spectrum including Majlis-e-Wahadat-ul-Muslimeen,Shia Ulema Council Pakistan, All Pakistan Shia Action Committee among others . 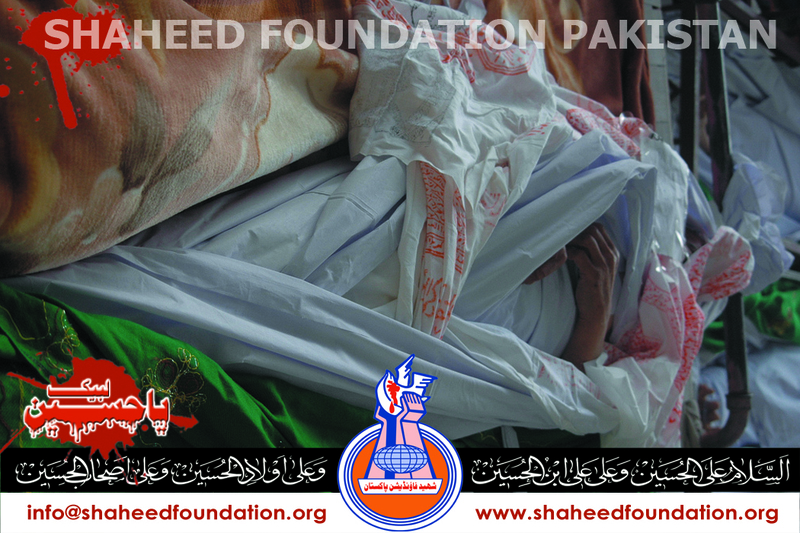 The burial process was scheduled to start today at 9am and was continuing till reports were last received. 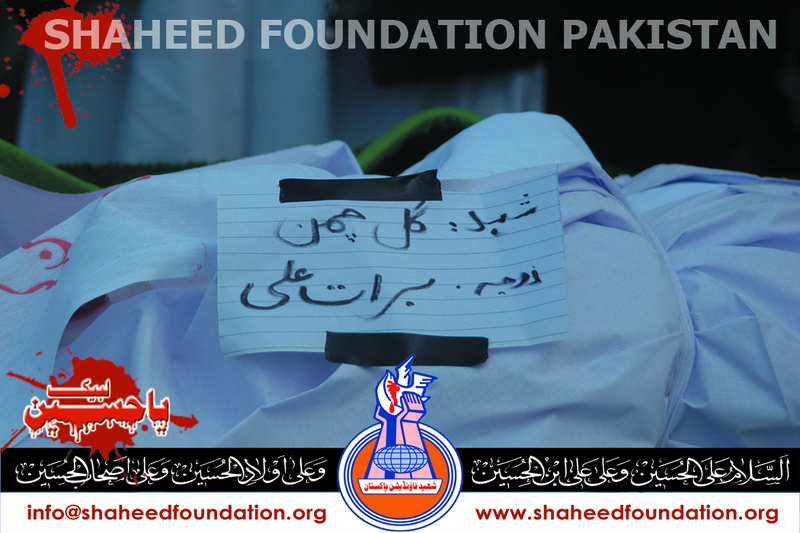 Finally we like to pay heartfelt condolences to Imam-e-Zamana(a.t.f.s), Khanwada-e-Shohada and all the momineen o mominaat on this heart rending loss of momineen-e-Millat-e-Jaffaria Pakistan . Shahadats will not end ,every one knows that they are an adornment for us and we love and opt for this end in the love of Masoomeen(AS) but the enemies of Islam and Pakistan must know that we will not sit short of driving them out of our pure lands as we are a resilient nation . 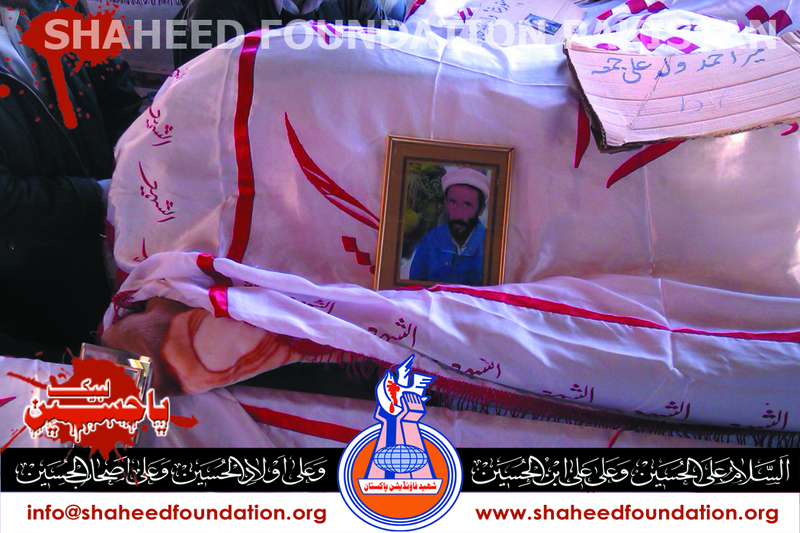 The burial of Shohada just not means the burial of Shohada alone ,it is with a resolution and it must be with the resolution that the yazidi system whom we have begun to haunt now Alhamdulillaah ,we shall bury the yazidi system ,inshallaah under the guidance of Khanwada-e-Shohada and Ulema-e-Karaam. Roads leading to Airport have been closed by protesting momineen in Rawalpindi. Similarly roads leading to airport have just been closed by protesting momineen in Lahore. 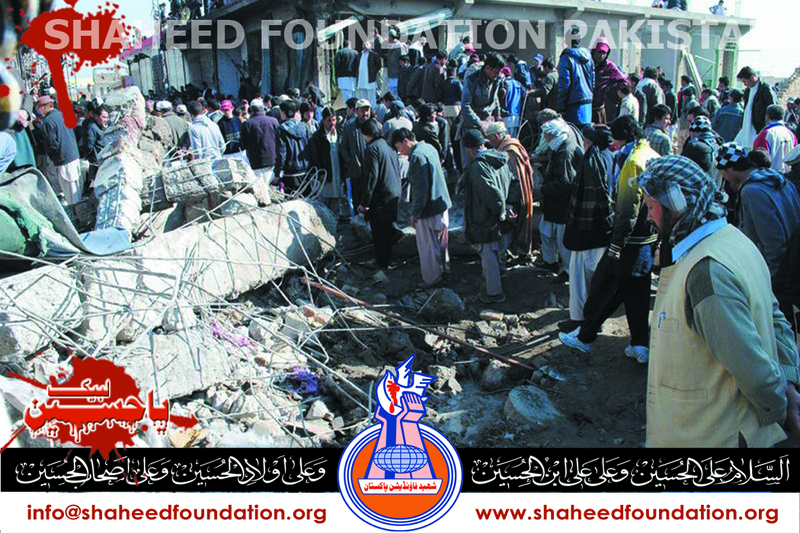 Meanwhile a spokesman of Majlis-e-Wahdatul Muslimeen requested momineen to stay connected to Ulema-e-Karaam and expressed solidarity with the wish of Khanwada-e-Shohada ,saying that even if one family of Shaheed is not satisfied ,Sit ins will continue. Imamia Students Organization's central president Brother Athar Imran in a quick ,insightful and a very mature decision advised that all Sit ins right across Pakistan where Imamia Students Organization Pakistan is participating, will continue till the final orders of Khanwada-e-Shohada . In Karachi alone sit in is being staged at more than 35 places amid reports of brutal use of state machinery against momineen in Kharadar area of Karachi as well as tense environs in the neighbourhoods of Lahore Airport . Taaqat ki Hai Aakhri Hichki! 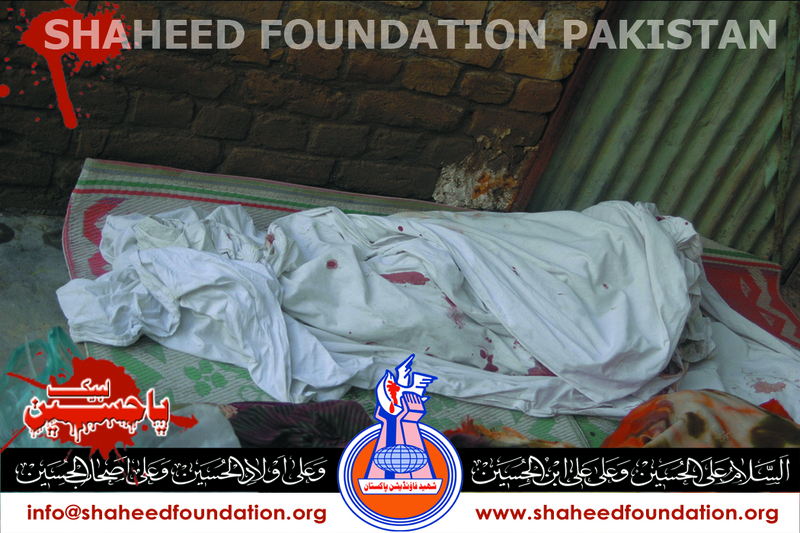 The number of Shohada increased to 78 identified Shohada as another injured of blast succumbed to injuries and embraced martyrdom .Shaheed has been identified as Ahmed Aali S/O Khuda Bakhsh aged 17 years. 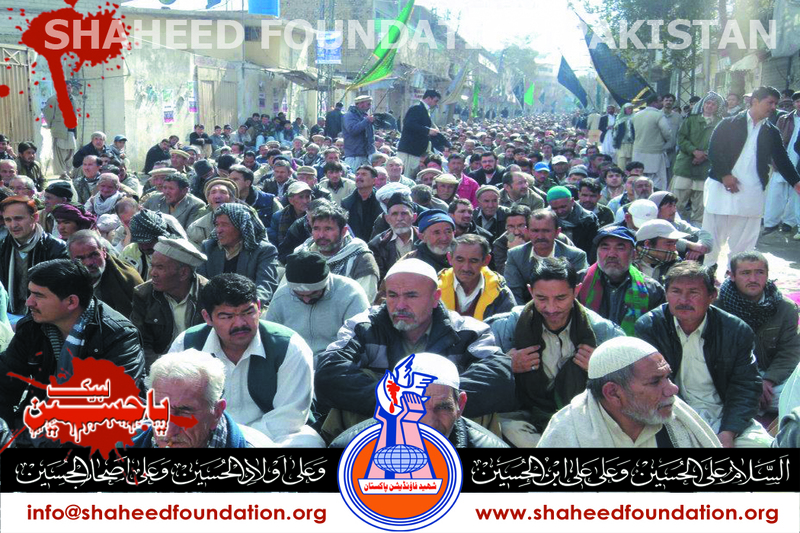 Meanwhile countrywide sit ins continue with full throttle to express solidarity with Khanwada-e-Shohada-e-Millat-e-Jaffaria Pakistan right across the length and breadth of the country. 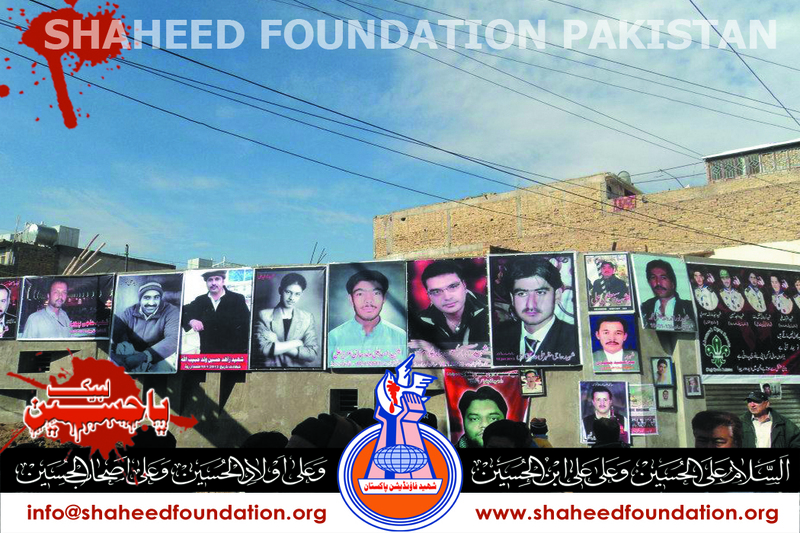 The protesting momineen are of the opinion that sit-ins will be ended only after Khanwada-e-Shohada begin burials of martyrs in Quetta . 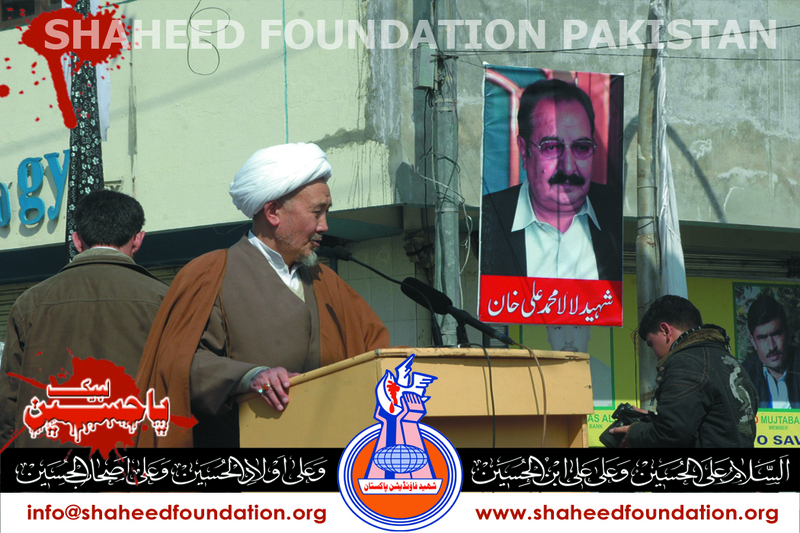 It may be noted that the initiative of Khanwada-e-Shohada who have been braving freezing cold in sub-zero environs of Alamdar Road and Hazara Town for fourth consecutive day was very warmly welcomed and supported by momineen right across the world and the participants included momineen hailing from diverse shia political spectrum and thoughts. 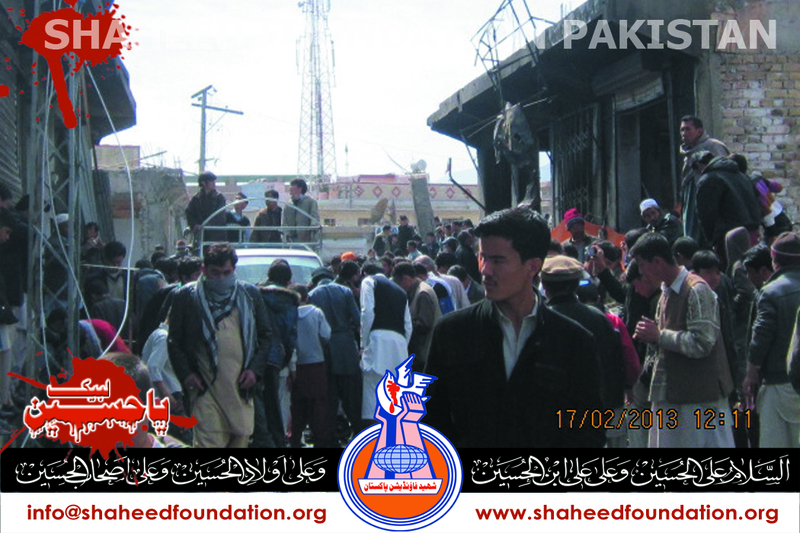 Although there were hints of some welcome gestures by those at the helms of affairs after thorough consultations but Khanwada-e-Shohada insist on concrete and solid implementation guarantees ,as the past indifference of the authorities have rendered them totally suspicious and undependable in the eyes of Khanwada-e-Shohada . 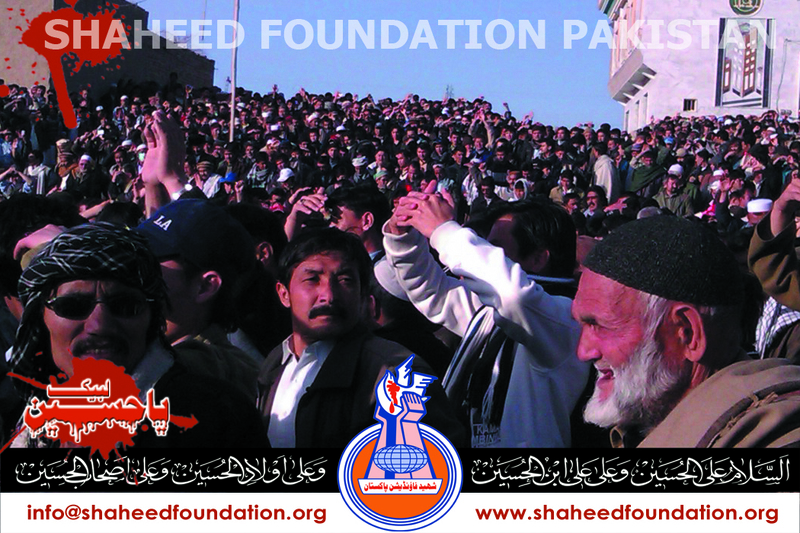 As of now all sit ins are continuing right across the country and all eyes are set on Khanwada-e-Shohada-e-Hazara Town Quetta . Aasmaan se jau laree thee wo zameen doob gayee! 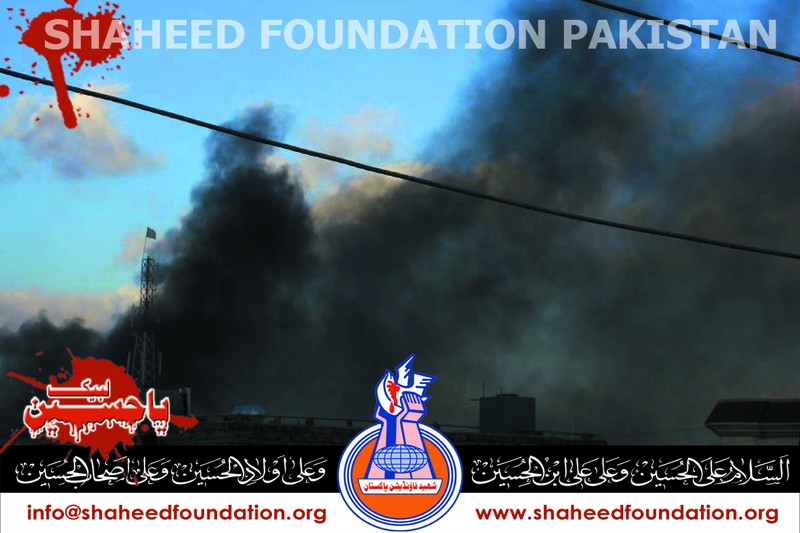 Watch Sit in Live from Karachi as Azadari Continues on Shahrah-e-Pakistan near Ancholi Society in Karachi. 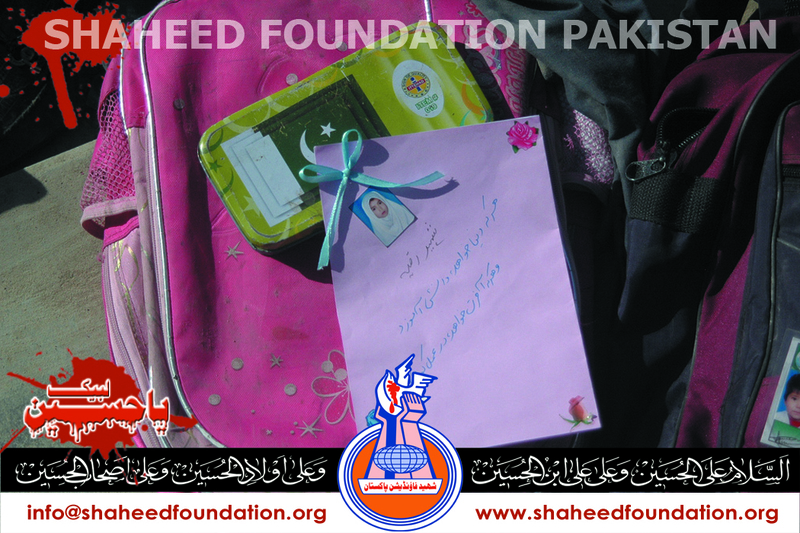 A heart rending address by a noble lady from Khanwada-e-Shohada at Hazara Town . Not just Quetta ,the entire Pakistan wears a charged ,yet very peaceful outlook . The response to enemies plot has been a very civil ,collective,disciplined and well thought out , that sent an impressive message to the world. 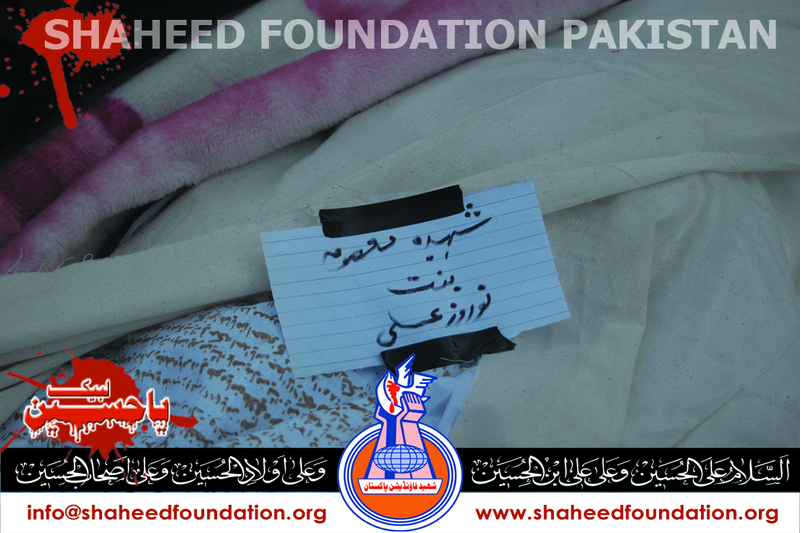 On many places the sit in participants were provoked and brutal use of force was opted but the participants kept their cool keeping in mind the noble objective ,so much so that while these lines are being written ,the situation is very well poised in favour of momineen and Khanwada-e-Shohada as more and more Sunni brothers ,Sunni Sisters and Children are joining the protest. 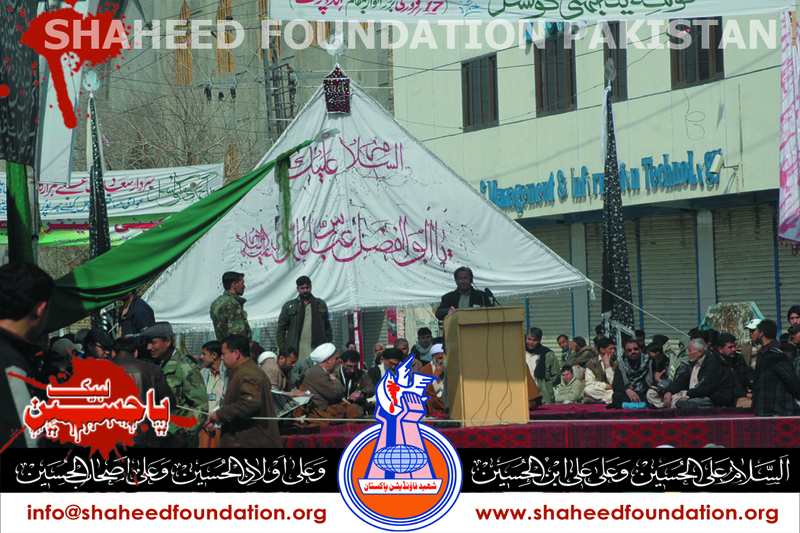 Some Sunni brethren are even running campaigns on different social network utilities and lending invaluable support to the oppressed momineen brethren of Quetta . 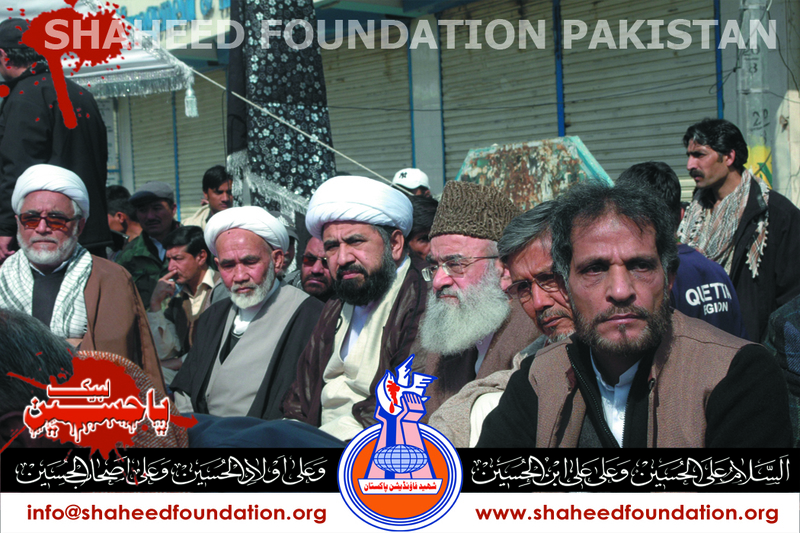 The greatest outcome is that in all these sit-ins all the three main stream political thoughts of Shia spectrum are seen as one , something that we have witnessed on so many occassions in the past too ,that all the crucial junctures all the momineen and all the Shia Ulema Karam participate above the personal affiliations and irrespective of whether the initiative is taken by one party or the other at a certain place. This has given rise to a unique trend over past some years ,where every one ,who is strong anywhere takes the initiative and is ably joined by all the others. 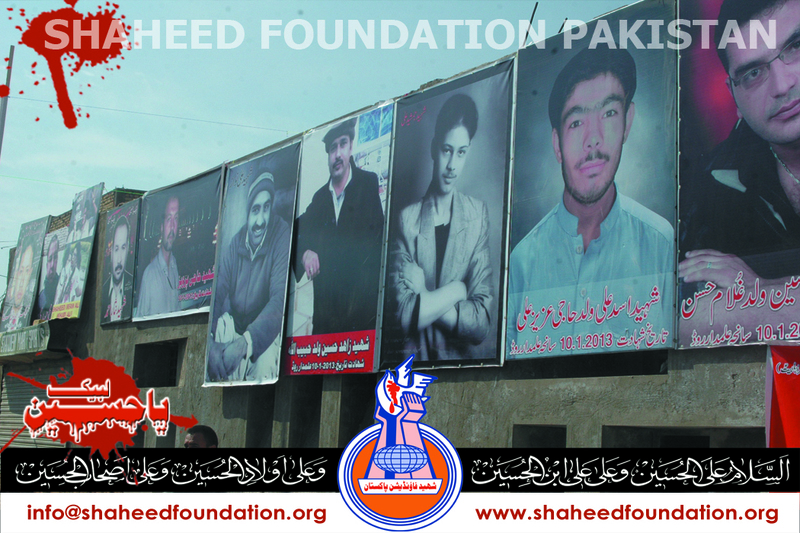 Hence as we may see there are a number of Shia political and social groups,anjumans ,institutions ,organizations who are all fully backing up the call of Khanwada-e-Shohada to the best of their ability. Meanwhile it has been learnt that the PM has hinted of changing IG Balochistan . Perhaps such eyewashes don't even fool even shia kids anymore. 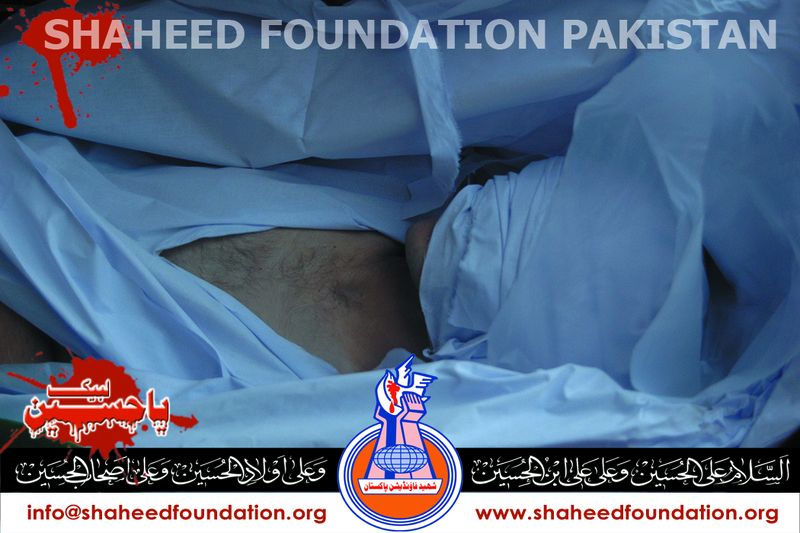 Every one right across Pakistan is only and only looking towards the wishes and decision of Khanwada-e-Shohada and Ulema-e-Karaam . 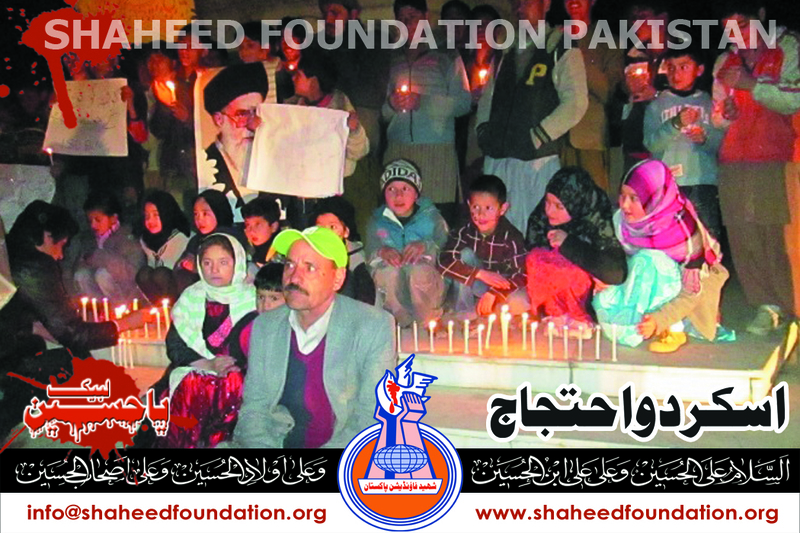 In a late night speech to the protesting momineen of Quetta , Agha Syed Jawad Naqvi urged that the youth of Quetta can bring peace to Quetta ,nobody else and in a charged atmosphere made an appeal to the protesting youth of Quetta to conduct the house to house search operations themselves and put on fire all safe shelters of terrorists themselves ,for the law enforcers have proven impotent ,incompetent and complicit in crimes against Millat-e-Jaffaria Pakistan . Addresses were made by Maulana Mirza Yousuf Hussain of Shia Action Committee as well among other leaders mainly from Balochistan Shia Conference ,Majlis-e-Wahdat ul Muslimeen and Jaffaria Alliance Pakistan . 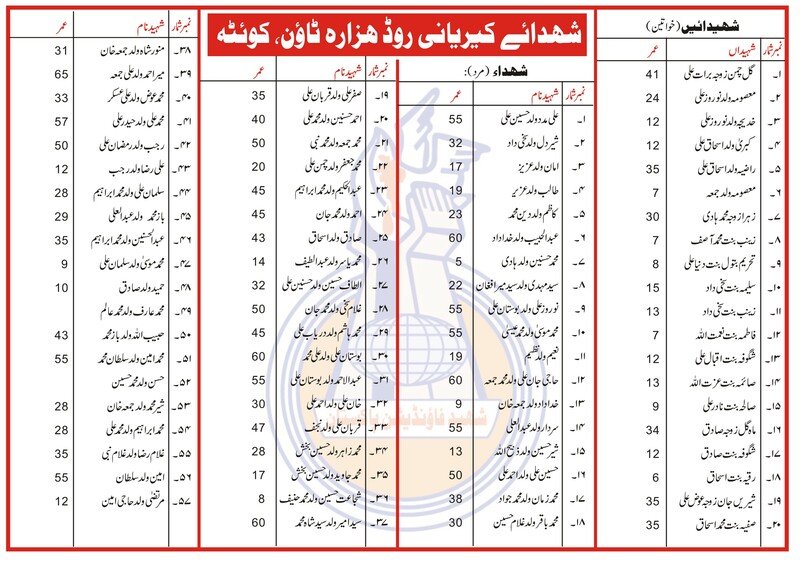 In Karachi alone sit in is being staged at 35 different places. In Mianwali Sit in is being staged . 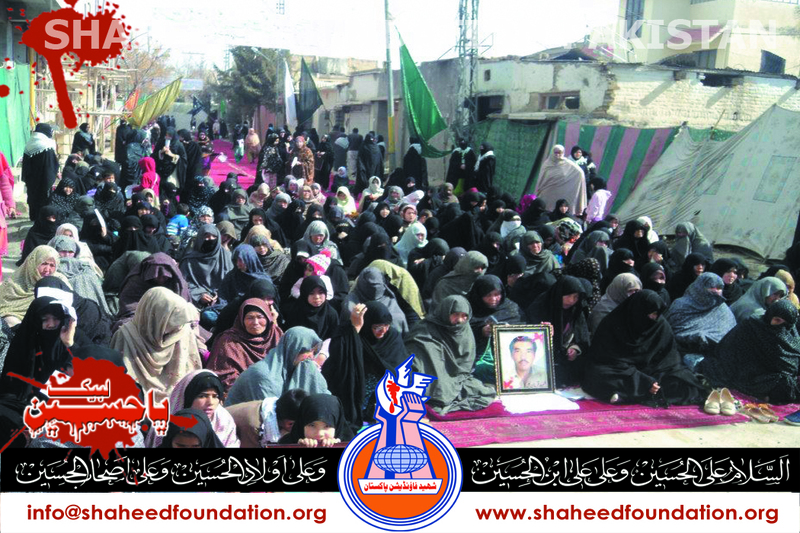 In Naseerabad Sit in is being staged . 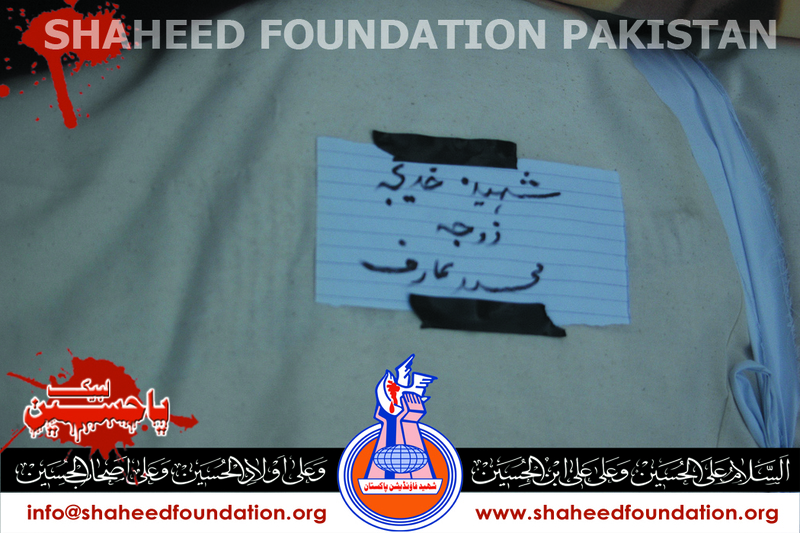 In Lahore Sit in is being staged at multiple places. 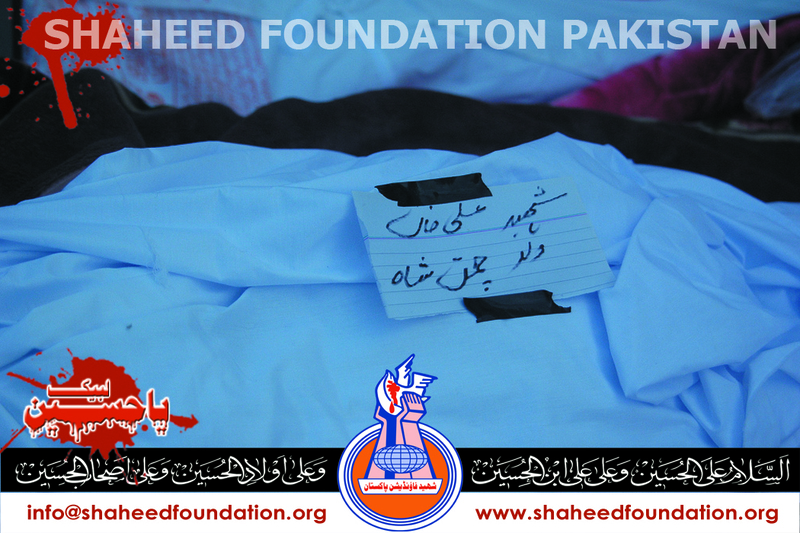 In Shehdad Kot Sit in is being staged . 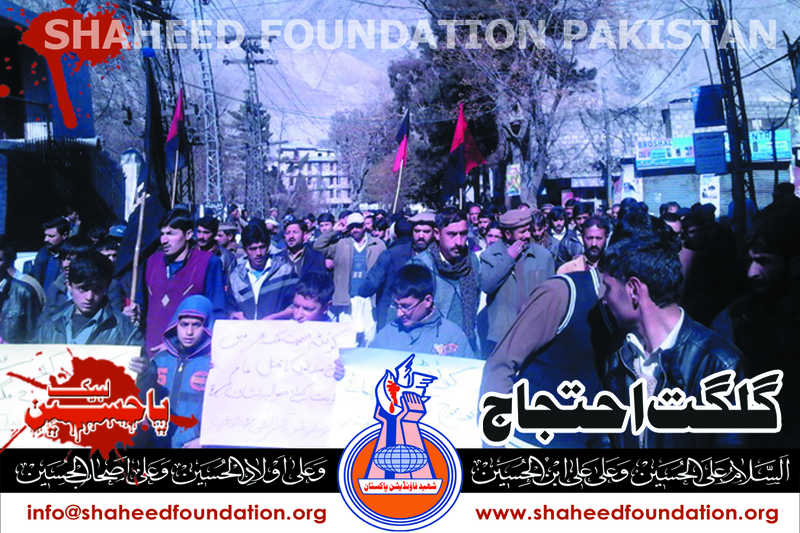 In Islamabad Sit in is being staged at Faizabad and Zero Point. In Moro Sit in is being staged . In Khairpur Sit in is being staged . 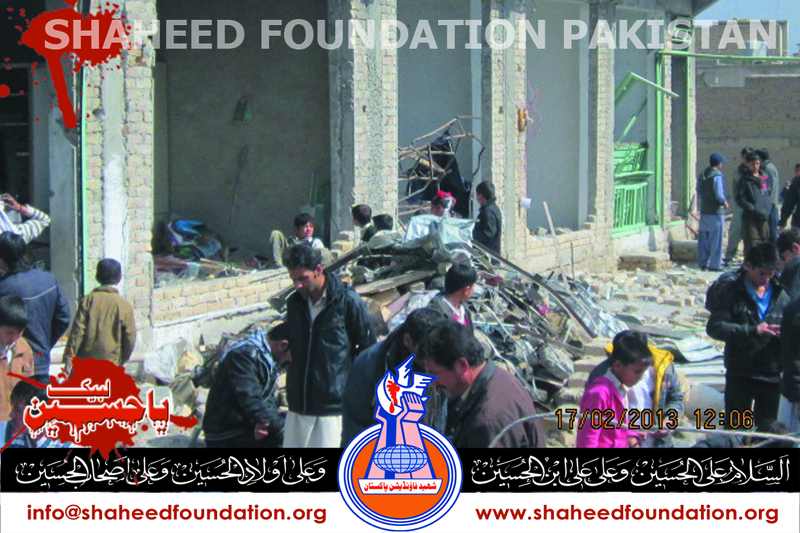 In Jhang Sit in is being staged . 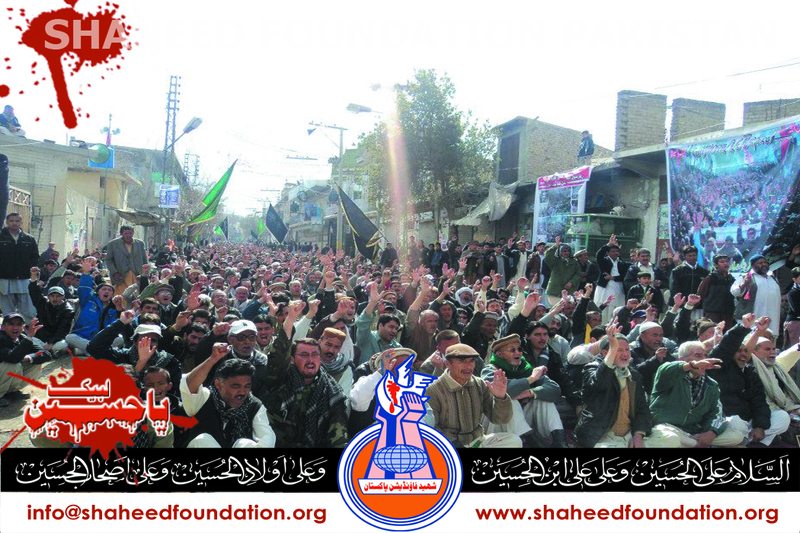 In Sibbi Sit in is being staged . In Narowal Sit in is being staged . 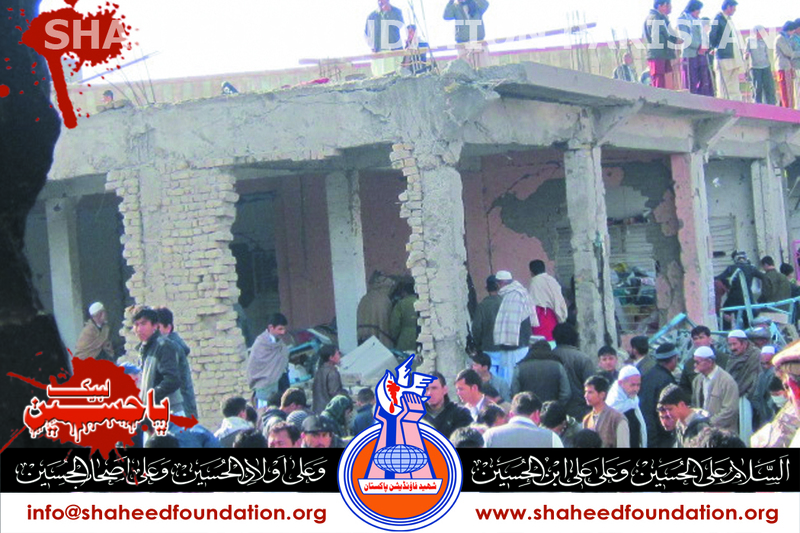 In, Dera Ismail Khan Blot Shareef Chasma Road Sit in is being staged . At Zero Point Islamabad Sit in is being staged . 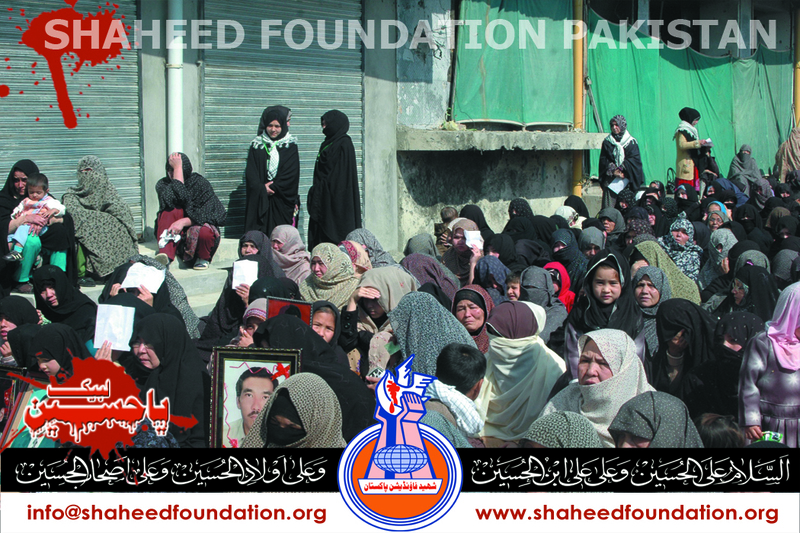 At Kashmir Highway Sit in is being staged . At Lahore Sit in is being staged at multiple places ,Lahore is nearly cut off from all cities. In Karachi 16 outbound and 3 incity trains schedule cancelled due to sit in on railway tracks at Juma Goth ,Malir and Bin Qasim. In Karachi 15 flights are off-schedule due to sit ins being staged . 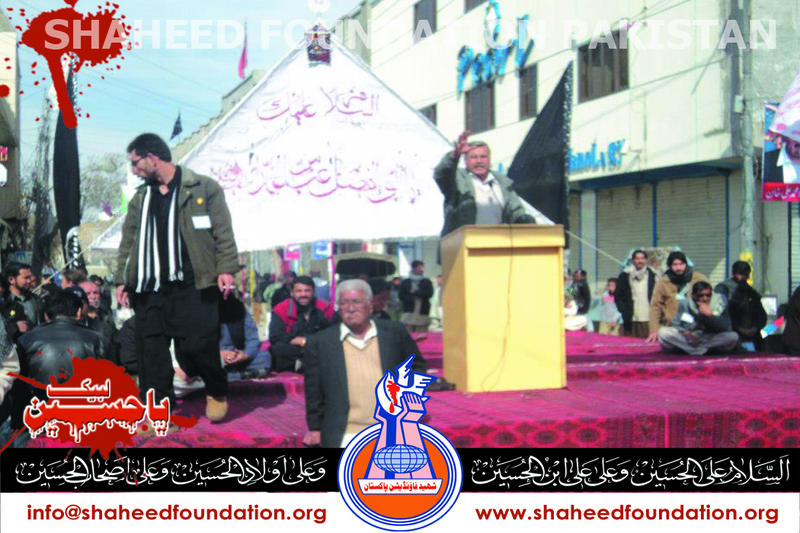 In Chakwal Sit in is being staged at Balkasar Chowk. In Dadu Sit in is being staged. 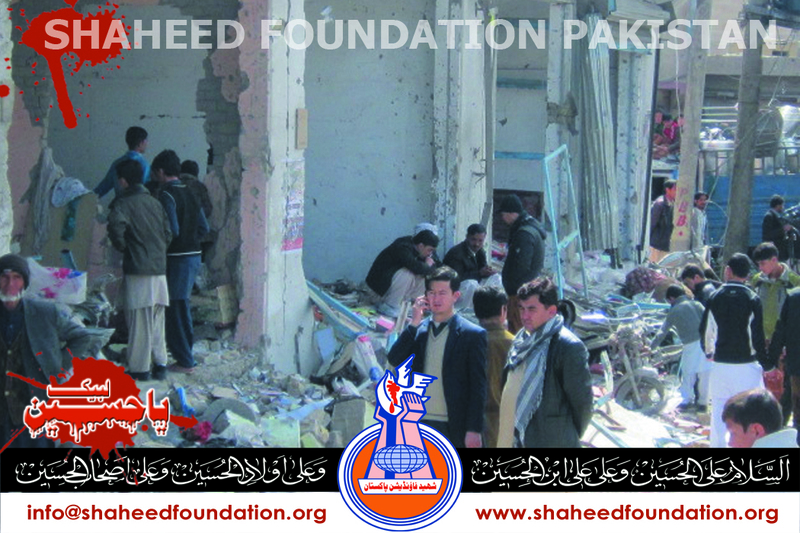 In Peshawar Sit in is being staged. 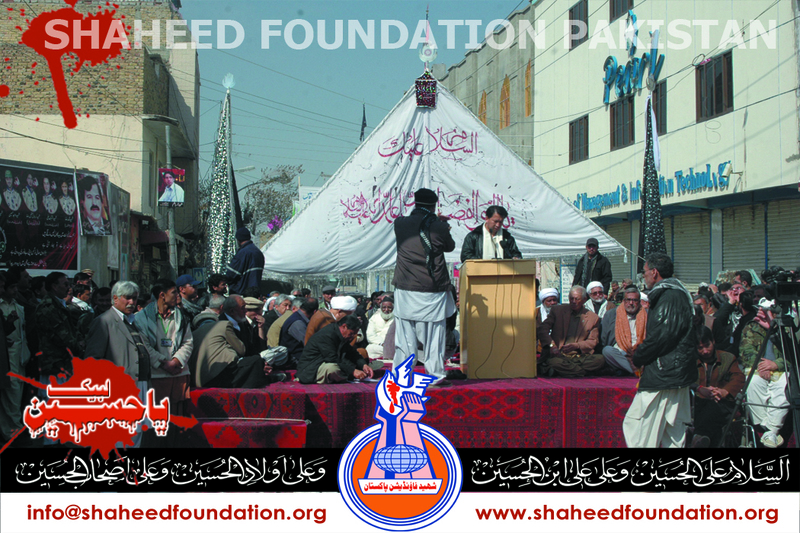 In Bhit Shah Sit in is being staged. In Saudi Arabia,Belgium ,Houston Texas and UAE Sit ins are being staged. 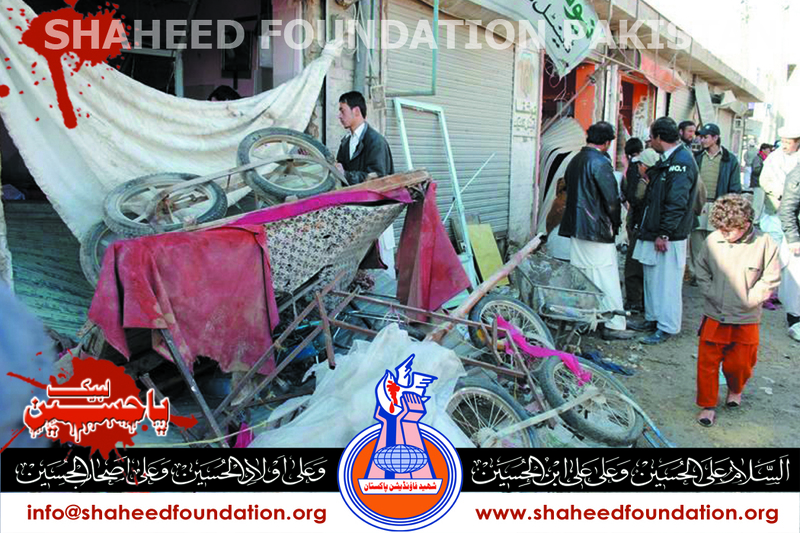 Its raining in Quetta and mercury has fallen down considerably but scores of thousands of momineen o mominaat are braving intense weather and staging sit in at Alamdar Road and Hazara Town in Quetta . 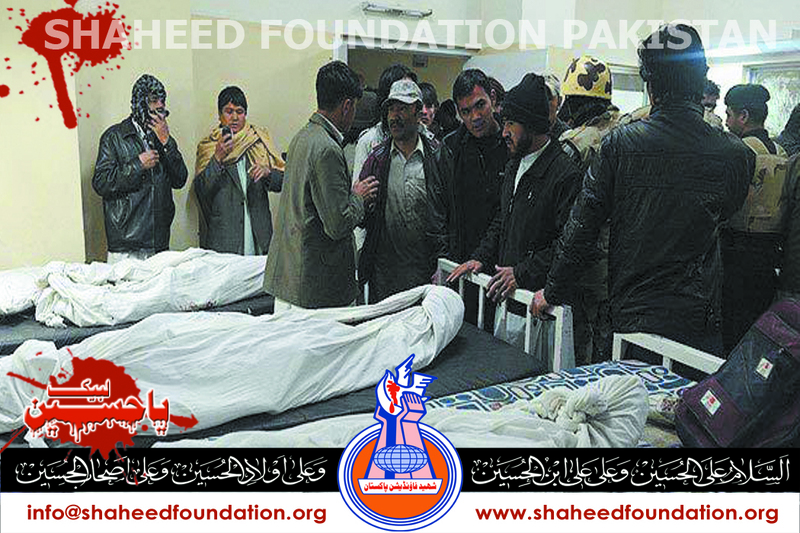 The Shahadat count climbs to 77 ,as 6 of martyrs have been identified from limbs and an injured of blast succumbed to injuries in CMH. Similarly sit-ins are being staged right across Pakistan. 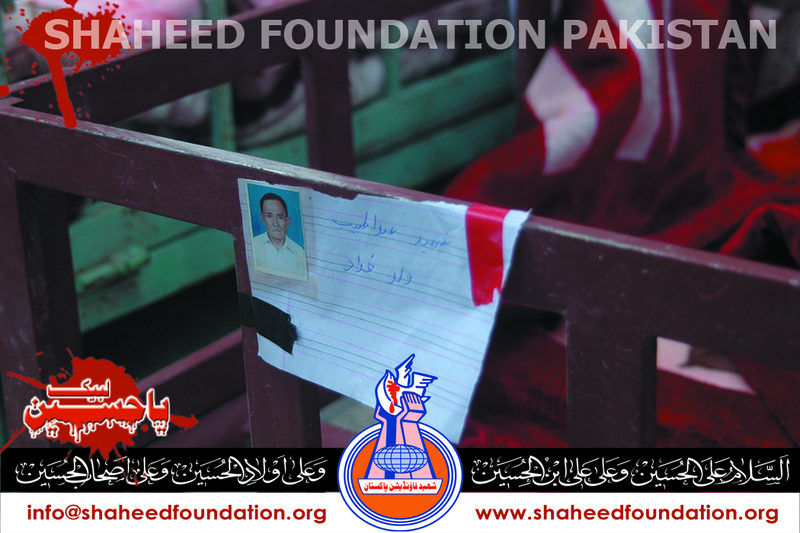 In Karachi Sit ins are being staged at a very large number of places. In Lahore sit ins is being staged at Governor house. In Lahore Thokar Niaz Beg Blocked by momineen. In Lahore Imamia Colony ,Press Club and Metrobus Services Blocked by momineen . In Lahore all upcountry and down country trains blocked by protesting momineen. In Islamabad sit ins being staged opposite parliament house. In Rawalpindi Sit in is being staged at Faizabad Interchange. In Gujrat Sitin being staged near Imambargah Harianwala. In Sukkur momineen staging sit in at Sukkur bypass. Mirpurkhas Hyderabad Road is Jammed near Tando Jam by protesting momineen. 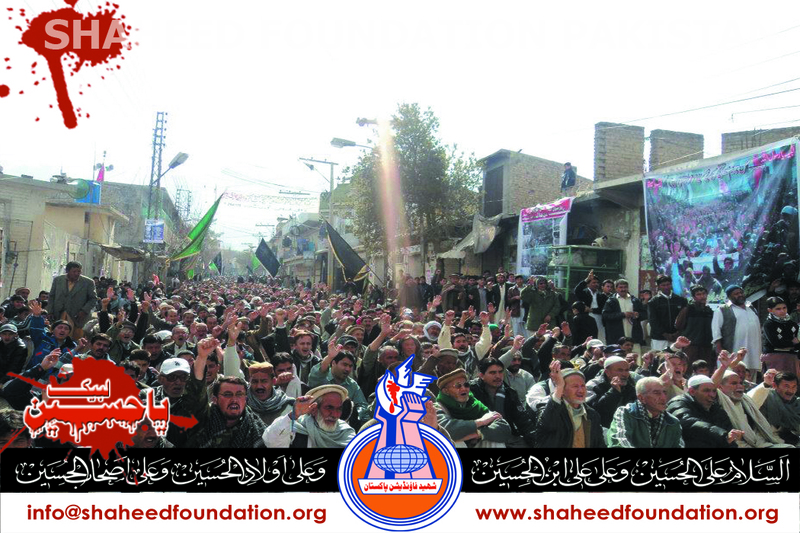 In Kargil Azad Jammu Kashmir Sit in is being staged to express solidarity with Khanwada-e-Shohada. In Taxila Sit in is being staged. In Multan Sit in is being staged. 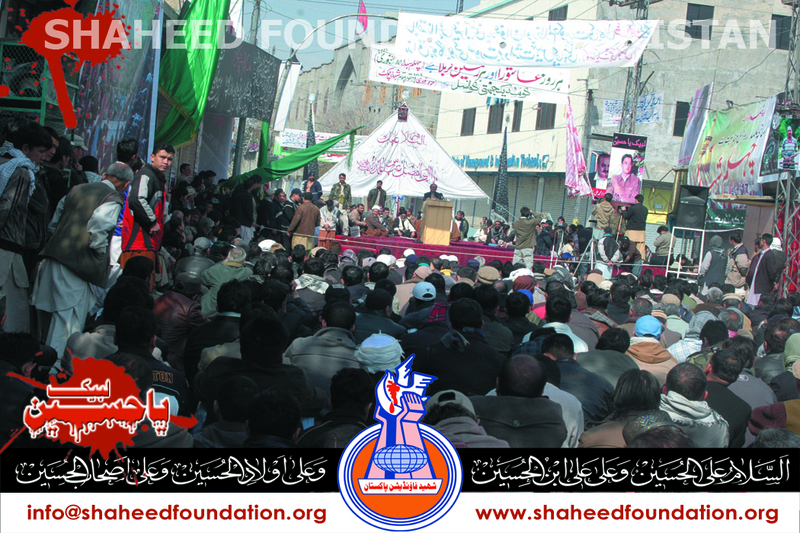 In Srinagar Occupied Kashmir sit in is being staged to express solidarity with Khanwada-e-Shohada. 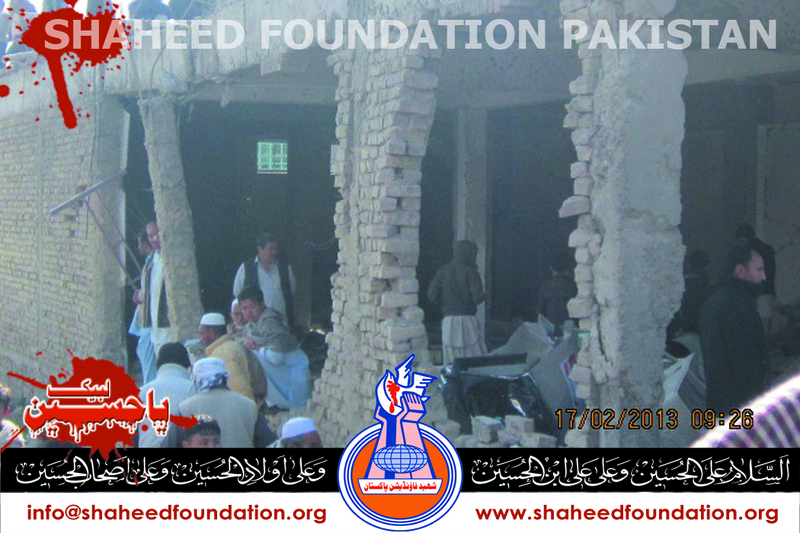 In Shorkot Sit in is being staged. 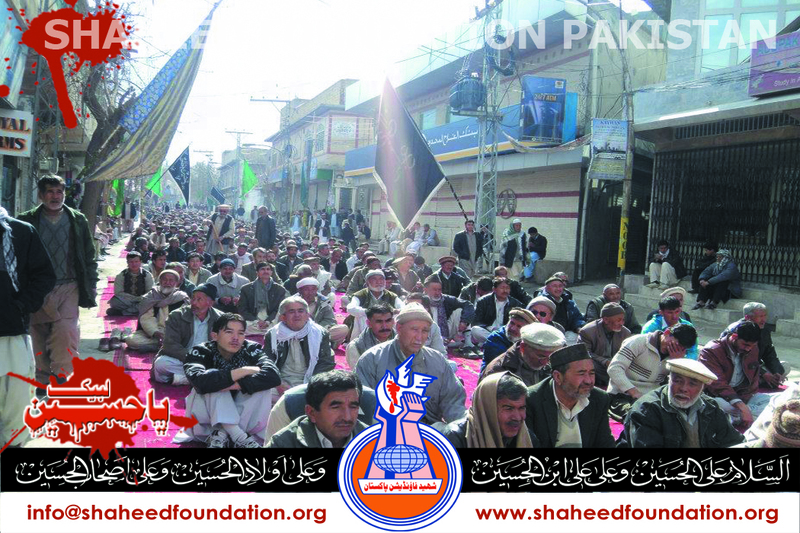 Sit in is being staged in Attock city. 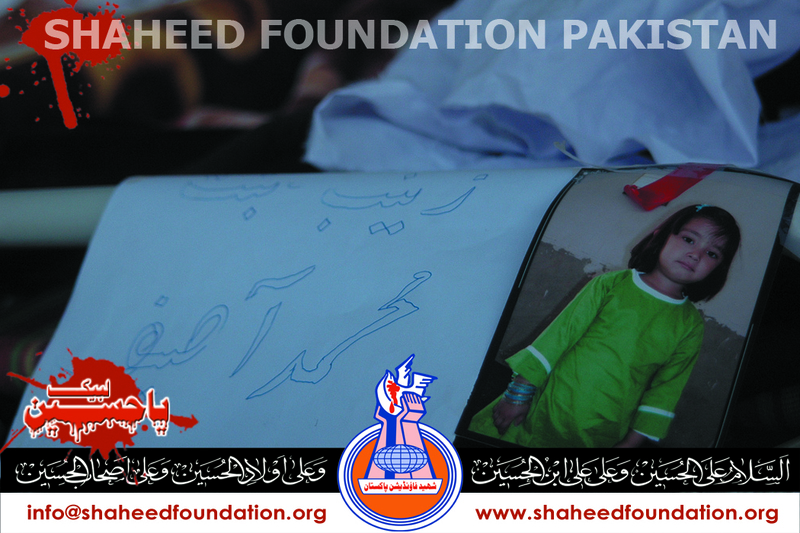 Scores of thousands of momineen o mominaat among them children ,ladies and elderlies are braving intense weather right across Pakistan to express solidarity and readiness to lay their lives for Khanwada-e-Shohada-e-Millat-e-Jaffaria Pakistan especially Khanwada-e-Shohada-e-Quetta where the heirs of Shohada are staging yet another exemplary ,historical and most peaceful protest of the entire history of Pakistan alongside the coffins of martyred beloved ones. At several places across Pakistan main arteries ,inter city links , railway tracks and roads leading to airports have been thronged by brave momineen o mominaat amid reports of use of brutal force on some places . In Karachi four flights have been delayed . Flight no PK-237 enroute to Dubai from Karachi has been cancelled . Several upcountry and downcountry trains have been halted due to sit ins staged at various interchanges and railway tracks. save face ,depicting a perfectly too little too late scenario . There have also been reports of arrests of few high profile terrorists circulating in the mainstream media , although it makes little difference , poor prosecution and inadequate jails have resulted in exoneration of even the most filthiest terrorists on many occassions as well as assisted and officially facilitated broad day light escape of several high profile terrorists in past too. 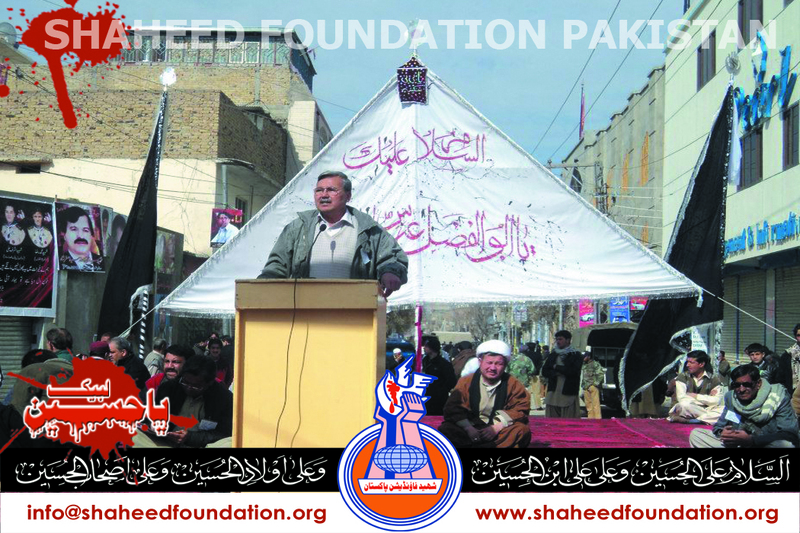 In Karachi alone ,there are sit ins being staged at a number of places,ironically enough they are now also being joined by fascist yazidis who have on their hands the blood of a number of shohada-e-millat-e-jaffaria too ,in a bid to gain political mileage. 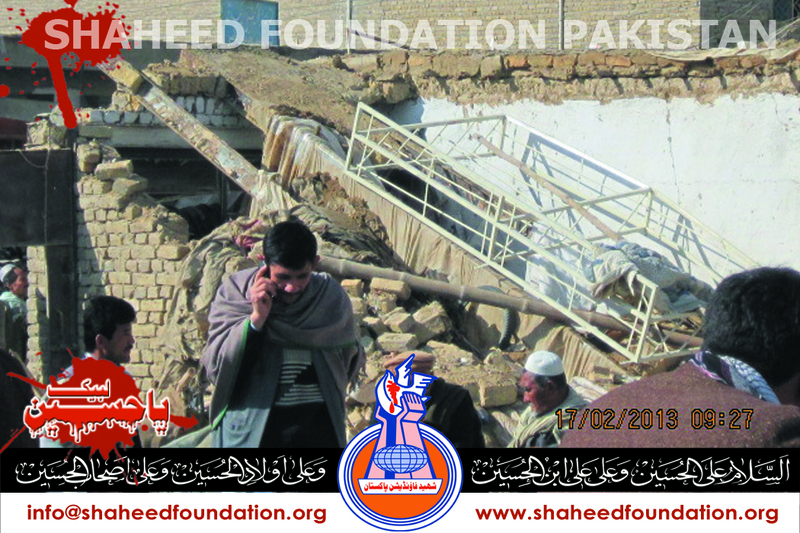 Millat-e-Jaffaria Pakistan however ,is one of the most aware lot on the face of earth ,repeated tragedies of three ,four decades has given Millat this valuable lesson that the only solution is unity among own ranks and completely pin hopes on Imam-e-Zamana(a.t.f.s) and the resilience of momineen . tumhain khabar hai lutairon ke sab thikaanon ki. shareek-e-jurm na hotay tau mukhbari kartay! Taghoot Pe Larzaa Taari Hai ! Dharna Ab Bhi Jaaari Hai ! Ajab kiaa hai jau naukhaizon ne sab se barh kar janaain deen! ye bachaay hain ,ke jinko jald sojanay ki aadat hai! Government resorts to brutal use of force on ladies and children staging peaceful sit ins at several places . 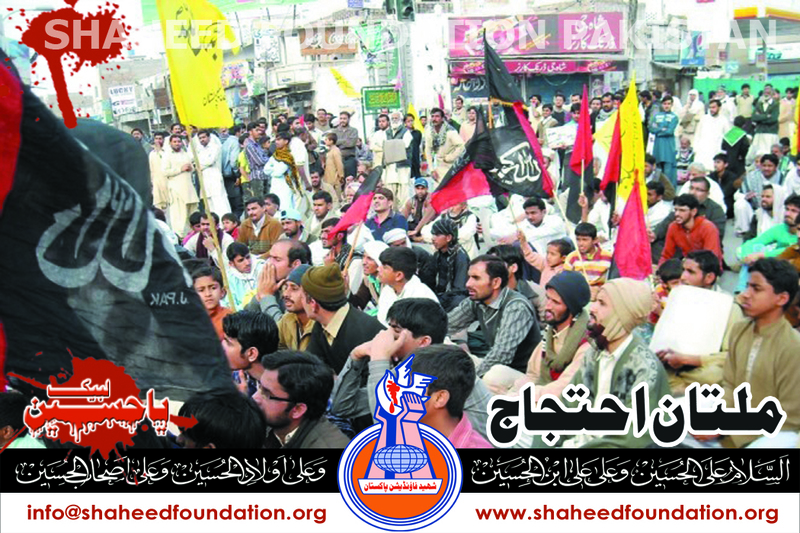 In Faisalabad ,Khairpur ,Gambat ,Subo Dero ,Shikarpur,Naushero Feroze ,Sukkur ,Mirpurkhas,Dera Ghazi Khan ,Parachinar ,Sialkot Solidarity is being expressed with Khanwada-e-Shohada in form of Sit ins , protests and shutterdown strikes. 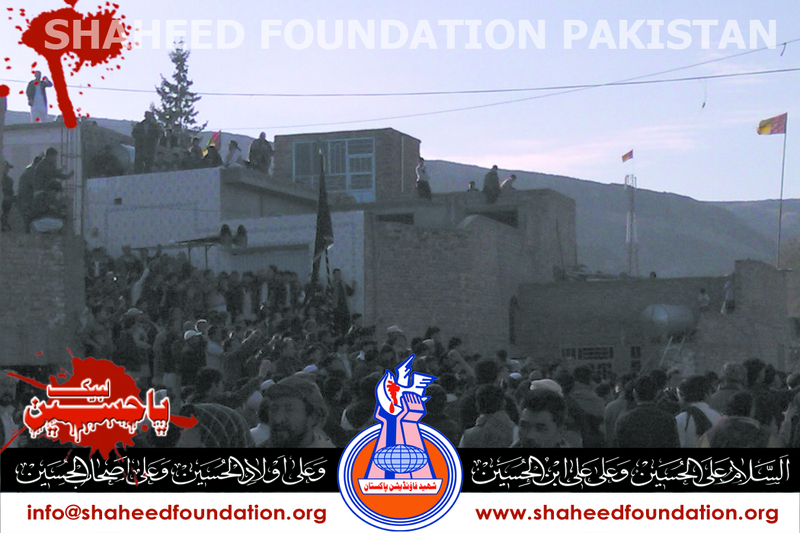 Hazara Town reverberates with Chants of Labbayk Ya Zehra ,Labbayk Ya Hussain . 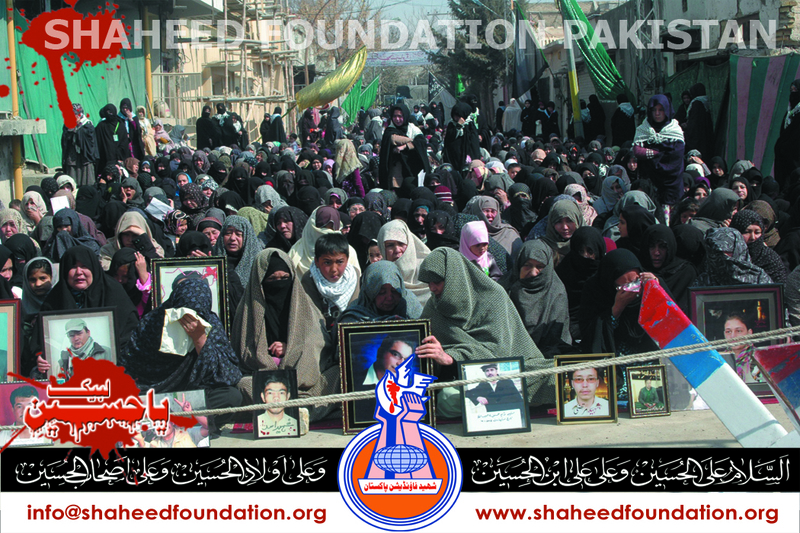 Ladies and Children of Khanwada-e-Shohada braving sub-zero cold in open skies for thirty seventh hour as they stage sit in alongside the coffins of their martyrs . 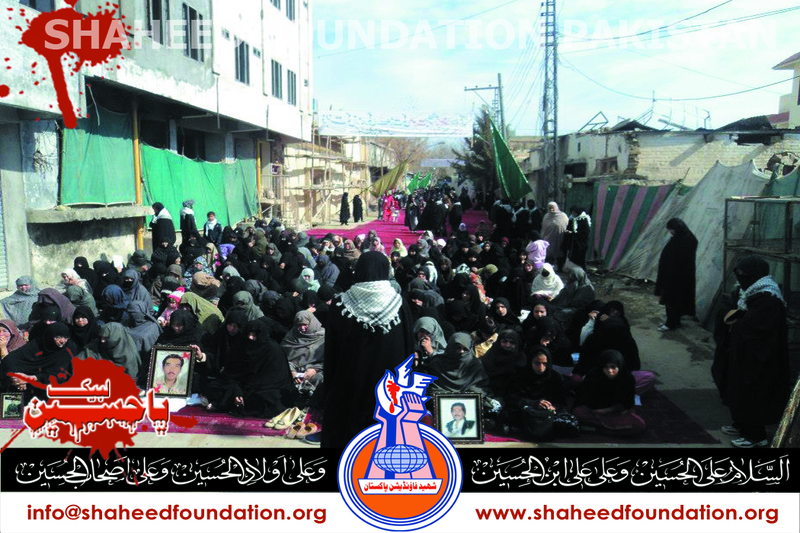 On Alamdar Road Quetta another stronghold of momineen sit in continues at its peak , initiative of ladies and children of Khanwada-e-Shohada has mobilized the entire world. Another sit in continues at Tibet Centre Karachi. Shahrah-e-Pakistan ,Shahrah-e-Faisal and Gulistan-e-Jauhar blocked in Karachi. In Sialkot Sit in continues at China Chowk. 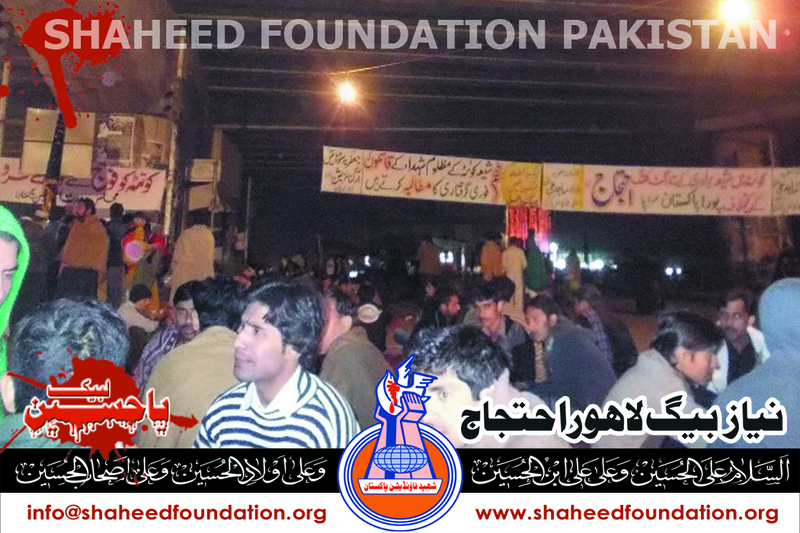 In Multan Sit in continues at Nawan Shehr Chowk. 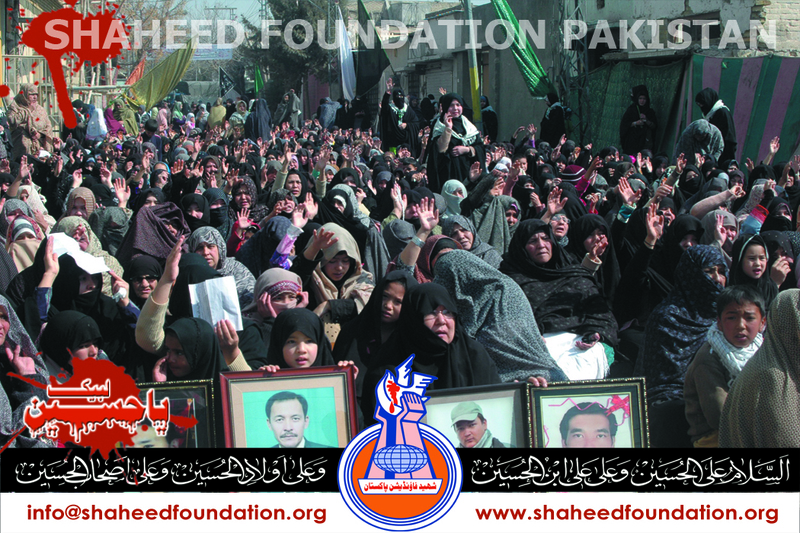 In Sargodha Sit in Continues at Block 19. 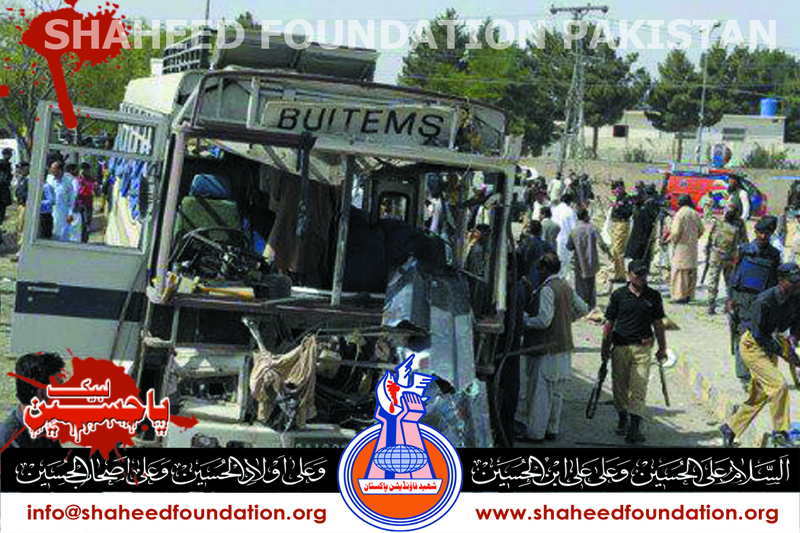 Khanwada-e-Shohada-e-Quetta`s Sit in Enters thirty seventh consecutive hour. 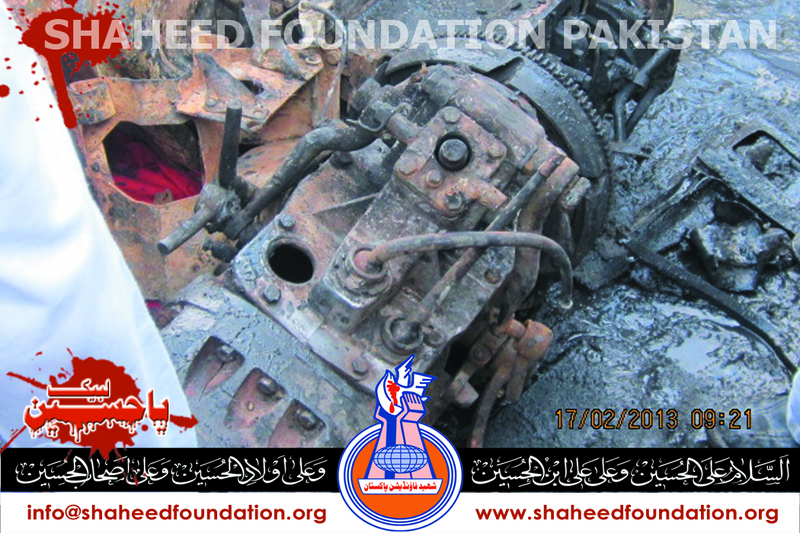 In Karachi Sit in is being staged at multiple places. 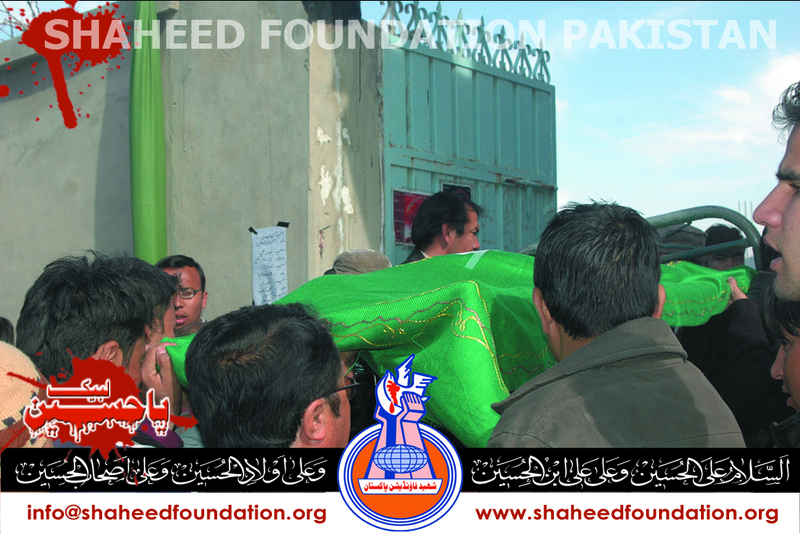 Khanwada-e-Shohada braving sub-zero temperatures in open skies at Hazara town with the bodies and coffins of loved ones. Karbala Ho Chuki Tayyaar! Sit in at multiple places in Karachi . 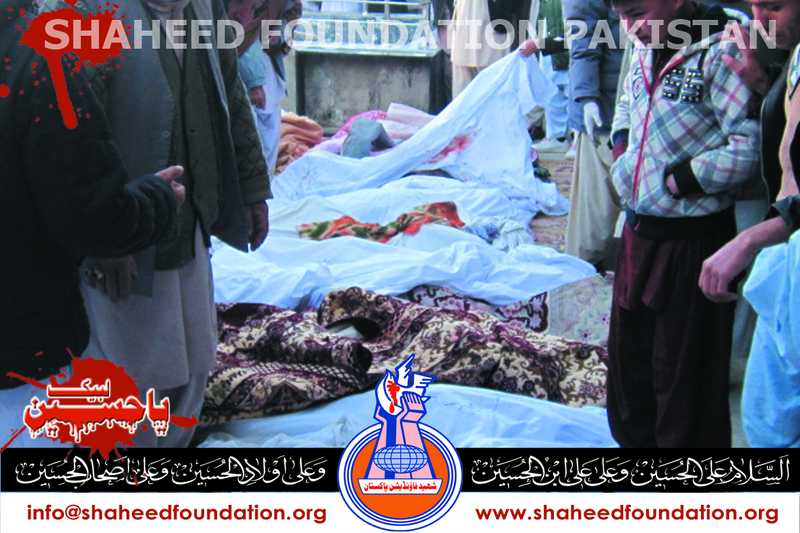 Saturday`s gruesome tragedy left atleast 70 momineen martyred and 180 momineen injured .Several momineen are still missing and have been believed to have been martyred as unidentified limbs were found . 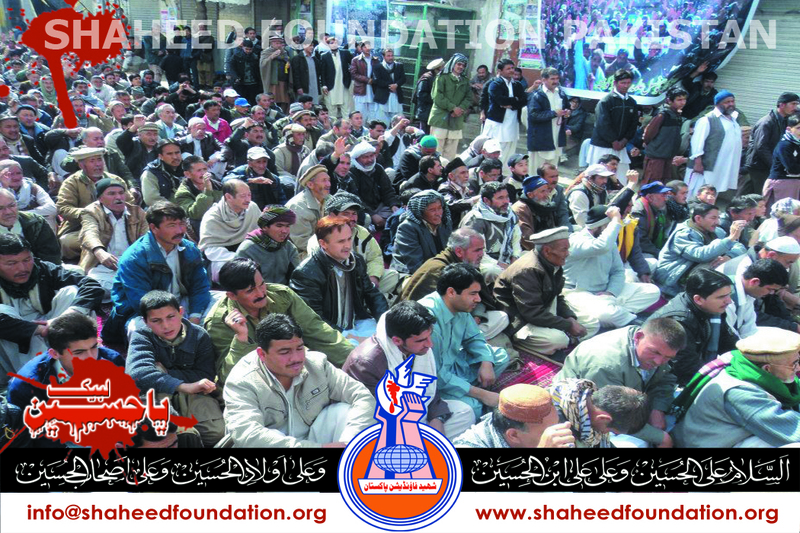 In Quetta scores of thousands of momineen are braving chilling cold and staging sit in to express solidarity with Khanwada-e-Shohada . 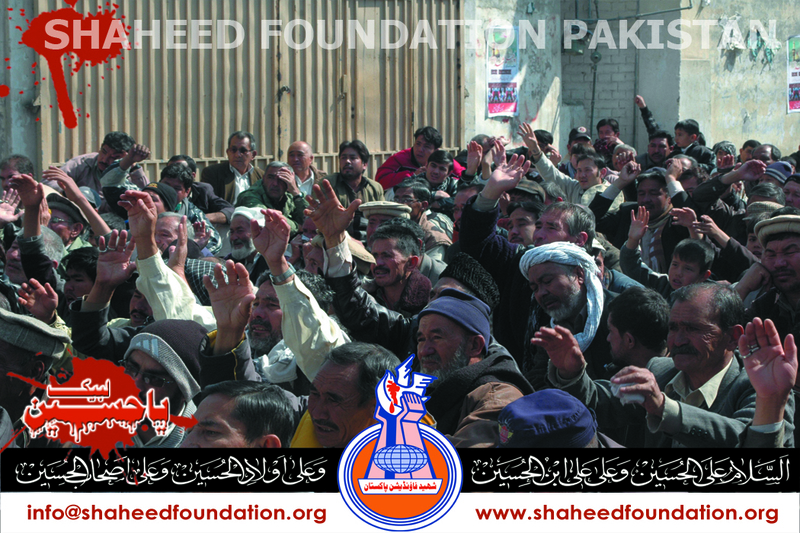 Across Pakistan massive mobilization are underway for countrywide sit ins . 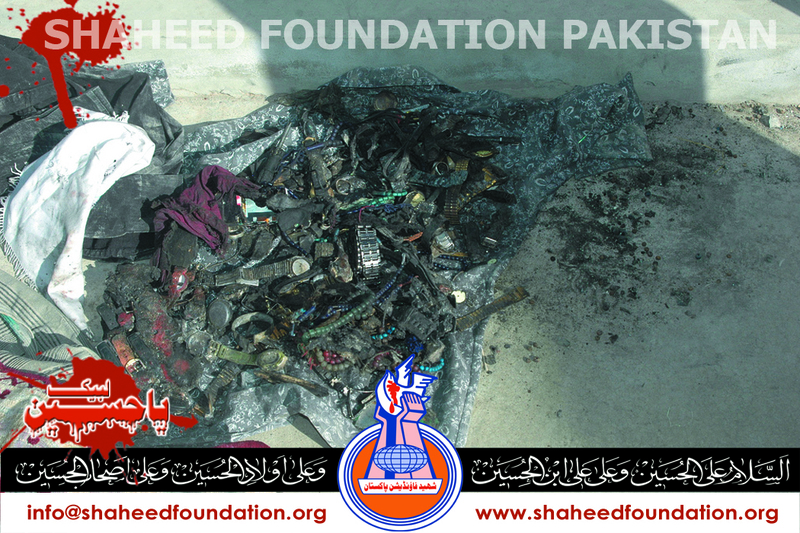 Meanwhile Ulema e Karam and Khanwada-e-Shohada gave a call for countrywide strike for tomorrow . 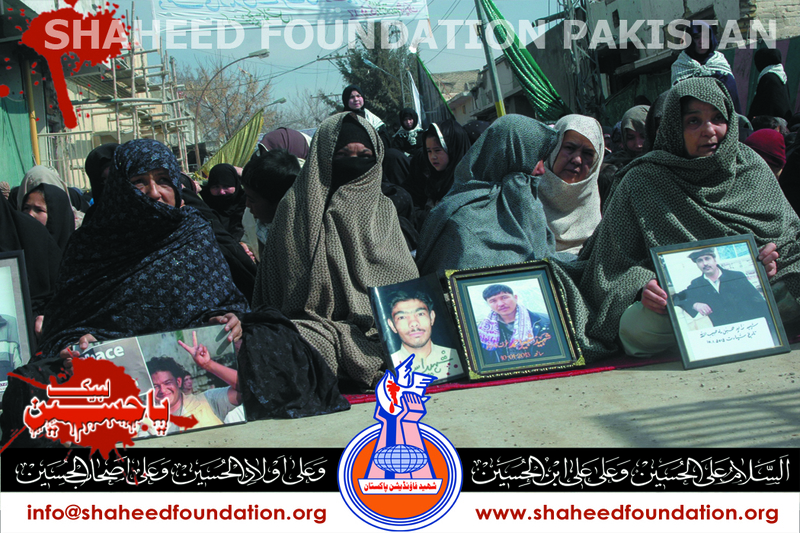 Women ,Children and elderlies are joining sit ins from different parts of the country in large numbers. In Karachi Sit ins continue at Nomayesh Chowrangi and Malir 15 . In Lahore Sit ins continue at Governor House Lahore,Imamia Colony. Islamabad Lahore GT Road blocked. 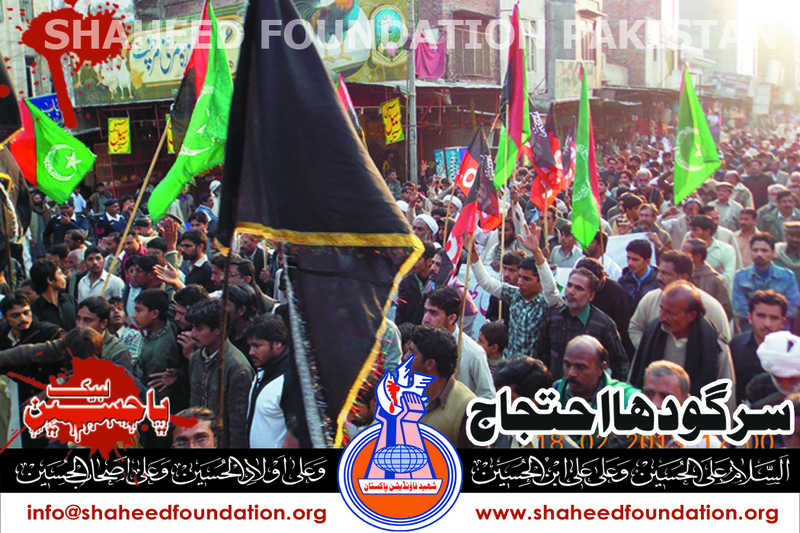 Scores of Momineen converge at Nawaan Shehr Chowk Multan. 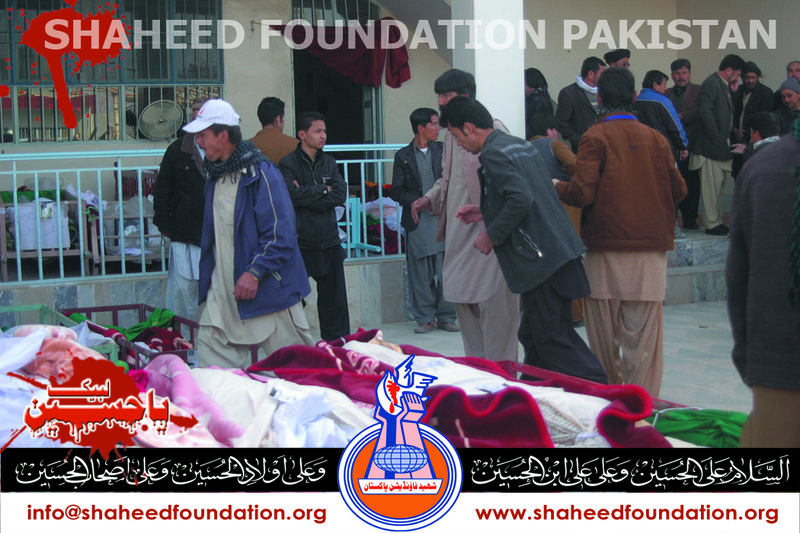 After intense consultations with the Khanwada-e-Shohada-e-Hazara town , Quetta Yakjehti Council ,has announced that the bodies of seventy martyrs the families insist will not be buried . 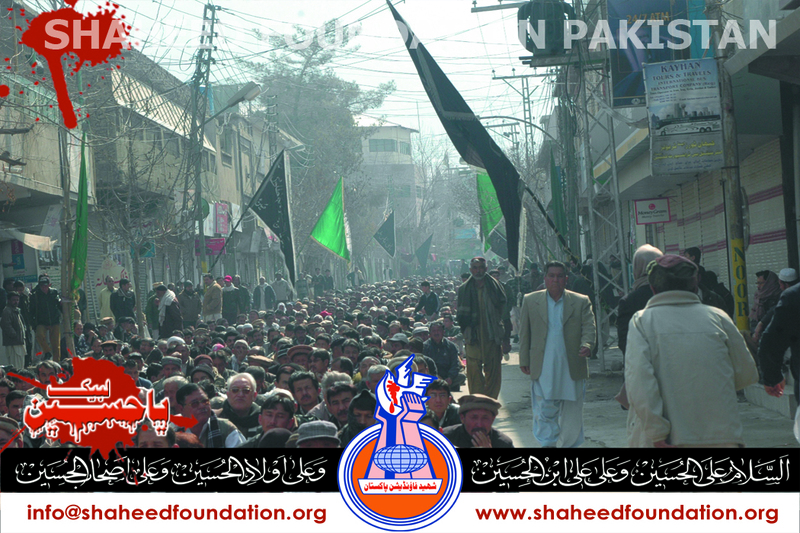 Earlier scores of thousands of momineen reached Kirani road from Alamdar road in the form of a caravan . 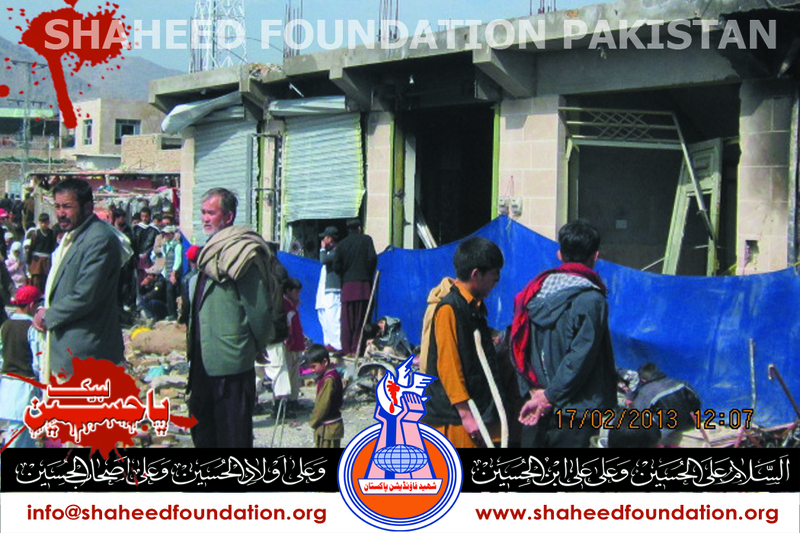 Shia Ulema Council ,Majlis e Wahdatul Muslimeen ,All Pakistan Shia Action Committee ,Jaffaria Alliance ,Imamia Students Organisation ,Jaffaria Students Organization and different shia organizations have expressed solidarity with the move made by Khanwada-e-Shohada . All protests rallies that were being staged across Pakistan by momineen in different places have been converted into Sit ins and massive mobilizations are underway . 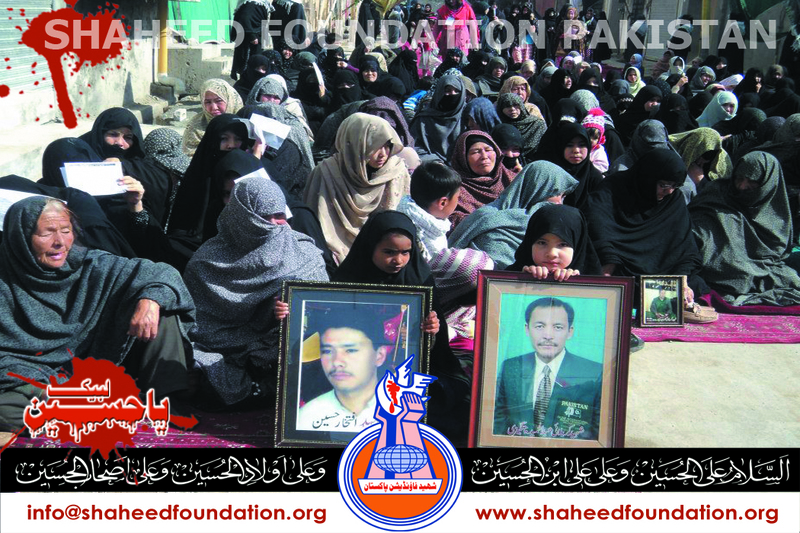 Hazara Town ke Khanwada-e-Shohada se Mushawrat ke baad Quetta Yakjehti Council ne faisla kia hai ke janazon ki tadfeen nahi ki jayegi aur guzishta dharnay ki tarz pe mulk geer dharna diya jayega. 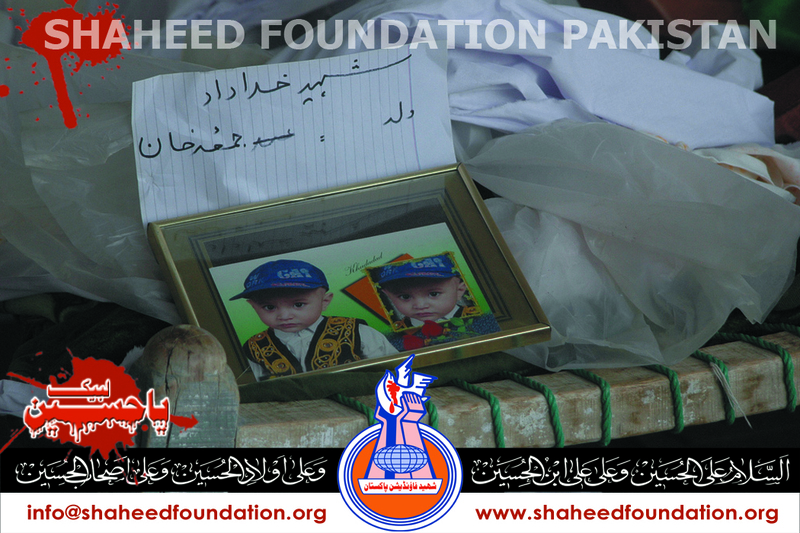 Isse pehle Alamdar road se ulema ki qayadat mein momineen julus ki shakl mein hazara town pohnchay thay aur inhon ne Khanwada e Shohada ke huzur taziyat pesh ki aur unse mustaqbil ke hawalay se mushawrat ki . Quetta Yakjehti Council ke aelan ke foran baad hi mukhtalif shia tanzimon aur idaron ne mulki satah par honay walon tamaam muzahiron ko dharno mein badal dya gaya hai . 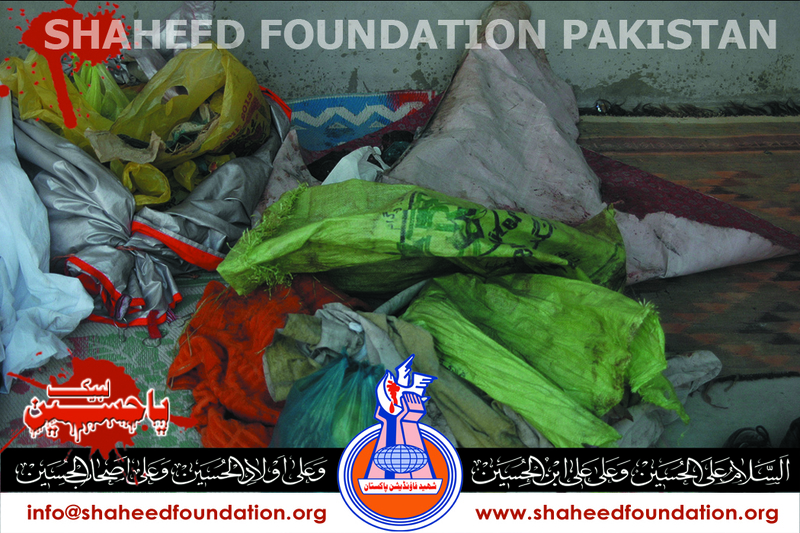 Is waqt Shia Ulema Council ,Majlis e Wahdat ul Muslimeen ,Imamia Students Organisation ,Jaffaria Students Organization,All Pakistan Shia Action Committee, Jaffaria Alliance PAkistan,Jaffaria Students Organization aur deegar tanzimo aur idaron ki jaanib se mulki satah par wasee paimanay par awaam ko mutaharrik rakhnay ke lye iqdamat jari hain. 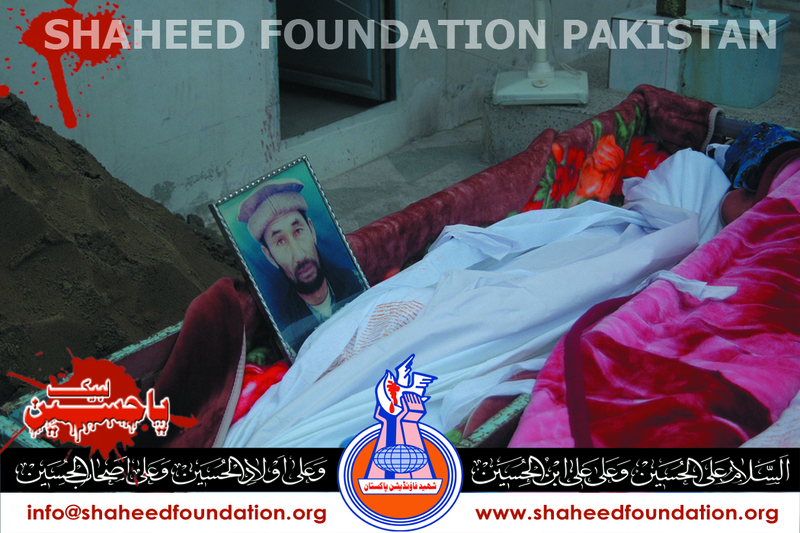 In Quetta, there are 70 bodies of Shohada in Musa Imam Jaffer imambargah. 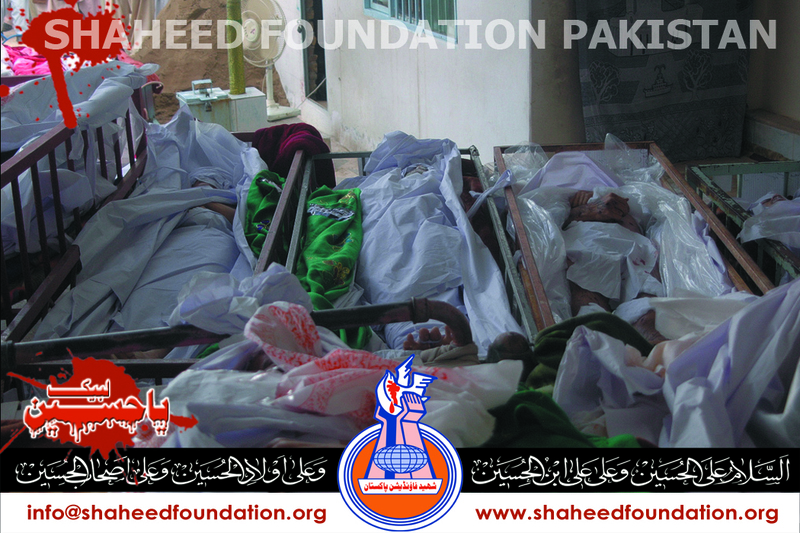 Other unidentified dead bodies are in Wali ul Aser Imambargah. 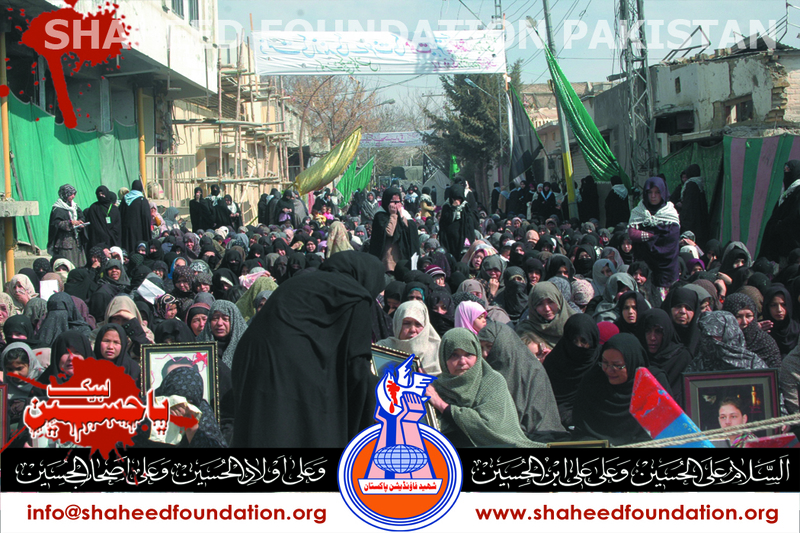 The participants of chehlum of shohada e alamdar road which is being observed today also reached at Musa Imam Jaffer imambargah where the meeting is continued between ulamaa and different shia organizations about future road map. 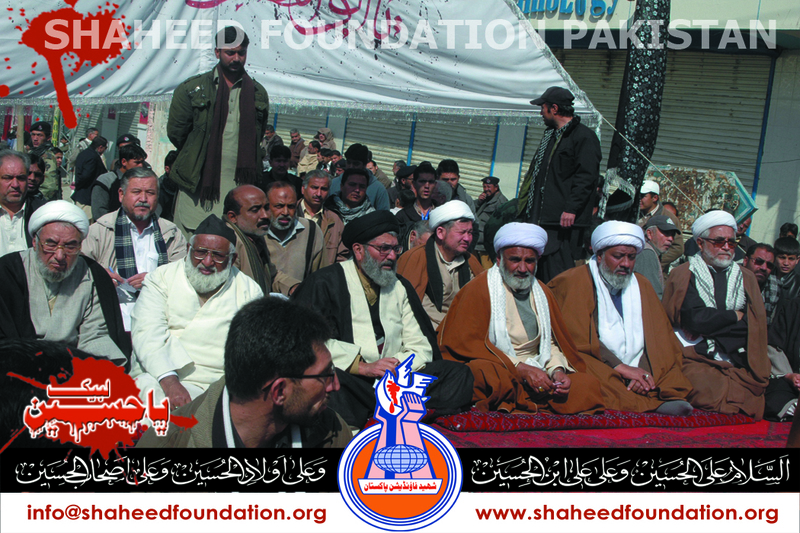 Among the speakers who addressed the mourning gathering program scheduled to commemorate the fortieth day of martyrdom of martyrs of 10th January twin blasts were Allaama Syed Sajid Ali Naqvi of Shia Ulema Council ,Allaama Raja Nasir Abbas Jafri of Majlis-e-Wahdatul Muslimeen ,Allama Ameen Shaheedi of MWM ,Allaama Mirza Yousuf Hussain of All Pakistan Shia Action Committee ,Sardar Sa`adat Hussain Hazara among others . The program was scheduled to be held today at 10 am on the venue of 10th Jan blasts at Alamdar road and was planned to continue after maghrebain originally . 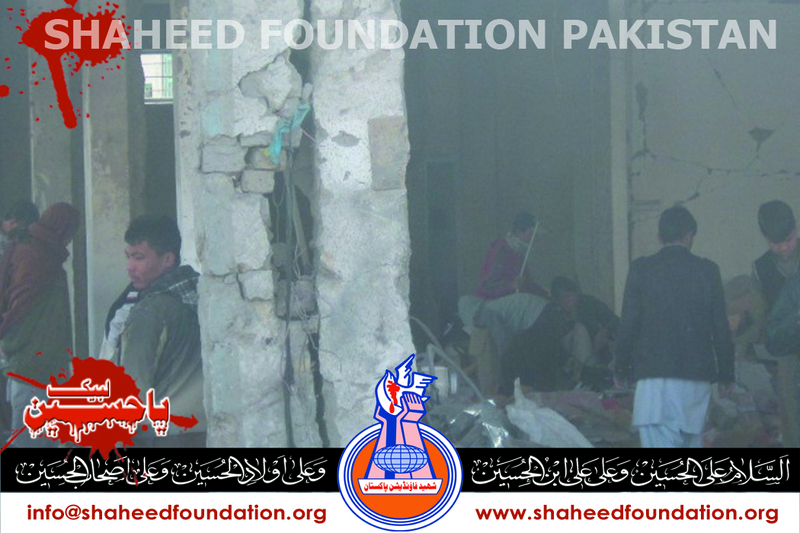 However ,after another gruesome tragedy of tremendous magnitude that struck the other important stronghold of momineen in Quetta at Hazara town yesterday evening around 5:30 pm , Ulema-e-Karaam and elders decided through consultations to begin the program on schedule as planned . It was announced minutes ago on behalf of protesting momineen commemorating chehlum at alamdar road ,that the program has been shortened with immediate effect. 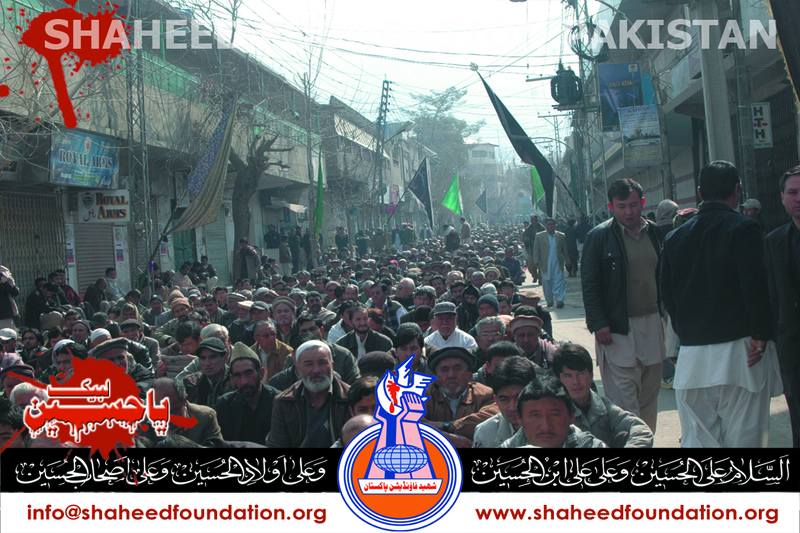 And now all the participants ,scores of thousands of them will move from Alamdar Road to Hazara town in the form of caravan and jaloos . 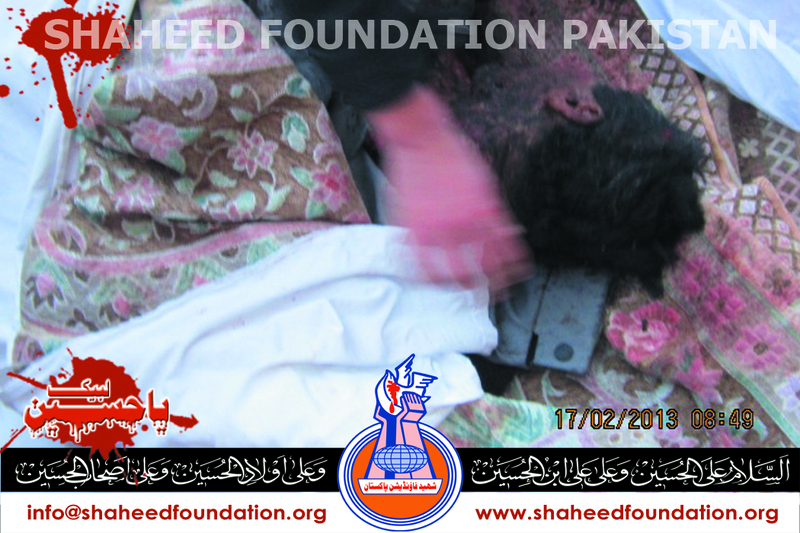 After meeting the Khanwada-e-Shohada ,Ulema e Karaam and elders will announce as to what will be next step. Meanwhile reports of continued protests are being reported from the entire length and breadth of the country . It has also been learnt that outside of Pakistan momineen are planning to stage sit ins and rallies to express solidarity with these noble shohadas whose blood has really awakened and re-vitalized the Millat-e-Jaffaria Pakistan. Ironically stringent security arrangements were seen in the neighbourhoods of the program perfectly depicting the too little ,too late scenario. Marjayegi Makhlooq to insaaf karo ge? 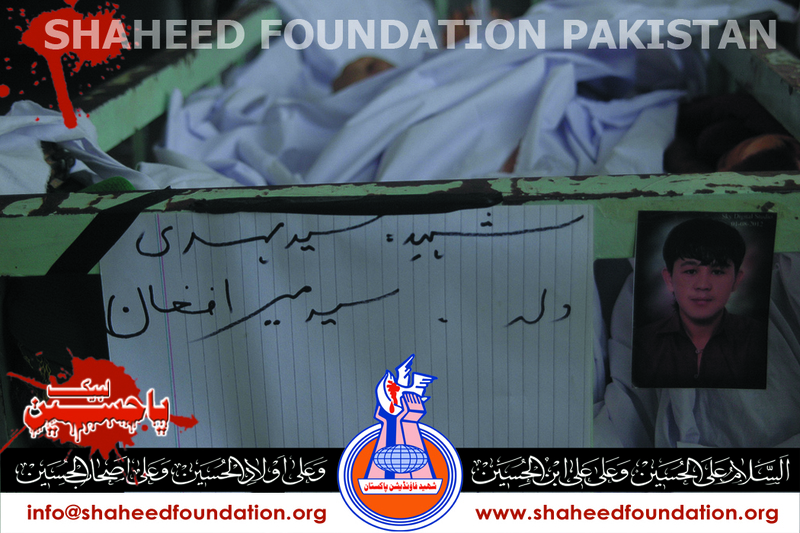 Munsif ho to hashr uthaa kiun nahi dete? It is incredible if somebody could even carry /transport a thousand kilogram of wheat without being noticed in any normal law-abiding place on earth. Incredible ,that such quantity of explosives were transported in presence of all that we have on this beloved land of ours. & Do these explosives grow like you grow mint in your backyards i.e anybody can cultivate and anybody can sell ? Thats a whole system infact . Somebody producing bulk quantities [ofcourse such facilities must have to be sophisticated can`t just be handlooms like facilities for sure] ,somebody making sure that they evade all radars and somebody making sure they reach the right target at the right time . If anybody is at all caught still amid all these challenges ,then you have the exoneration cheques ever ready from the fragile and imploding prosecution system . These are very important questions analysts believe ,its all either sheer incompetence or sheer connivance or both .No fourth option seems to fit the bill. 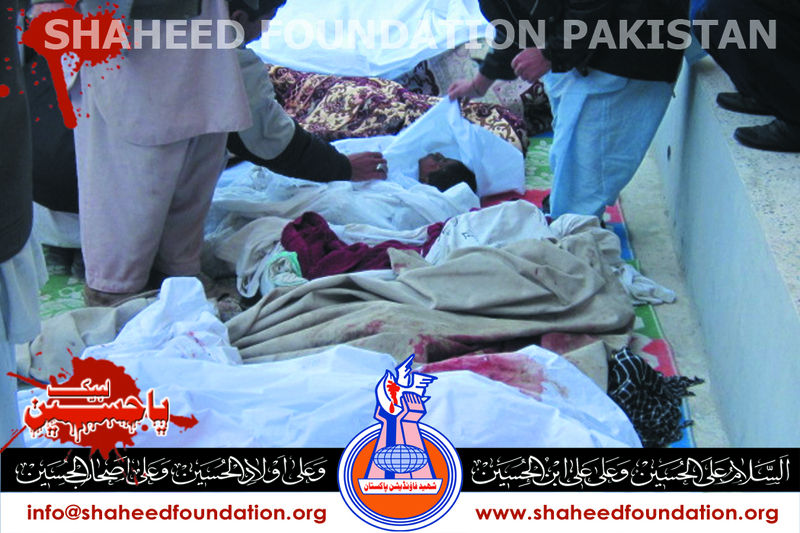 That said ,however the blood of Shohada has become the binding glue for Millat-e-Jaffaria Pakistan as well as guiding beacon .It has imparted immense elevation in awareness level of momineen both at individual and collective level . 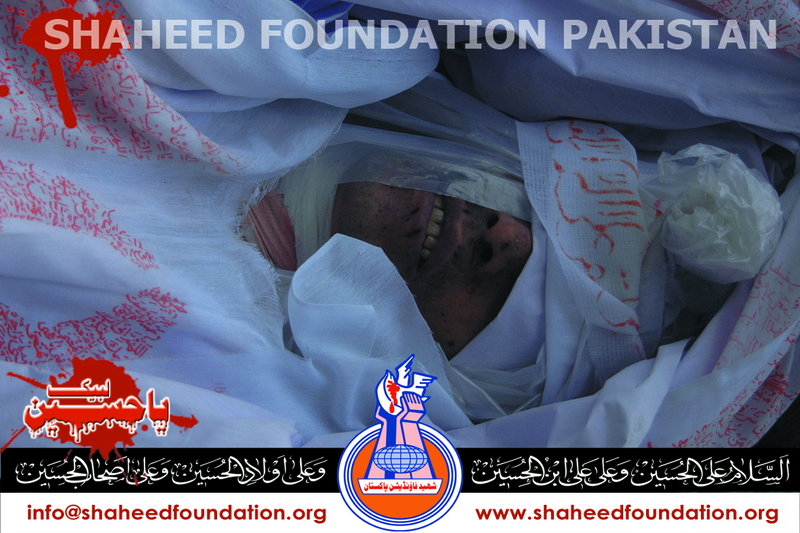 Shahadat is our adornment and our earnest longing is for such a fitting end on the path of Martyrs inshaallaah. 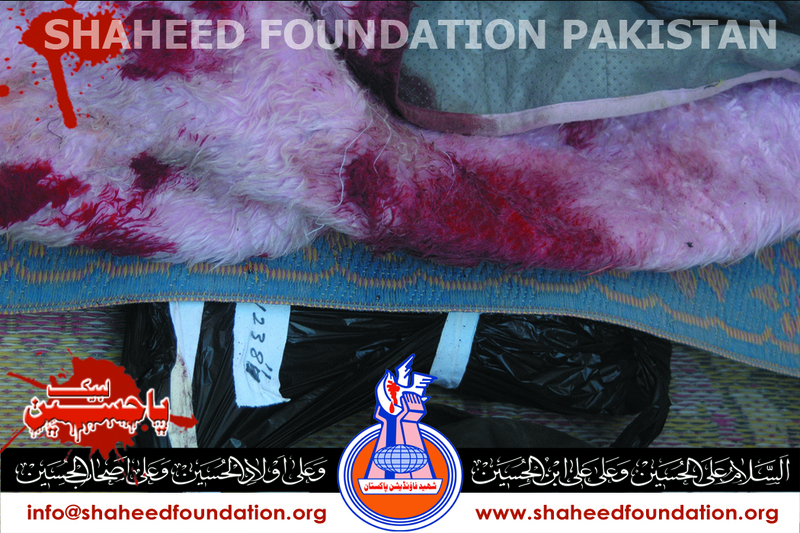 The blood of Shohada will stamp the ultimate victory of Millat-e-Jaffaria Pakistan . Global arrogance and imperialism ,her sycophants and paid puppets ,as well as their local takfiri and liberal collaborators will be sent packing from the pure lands of muslims one day inshaallaah . 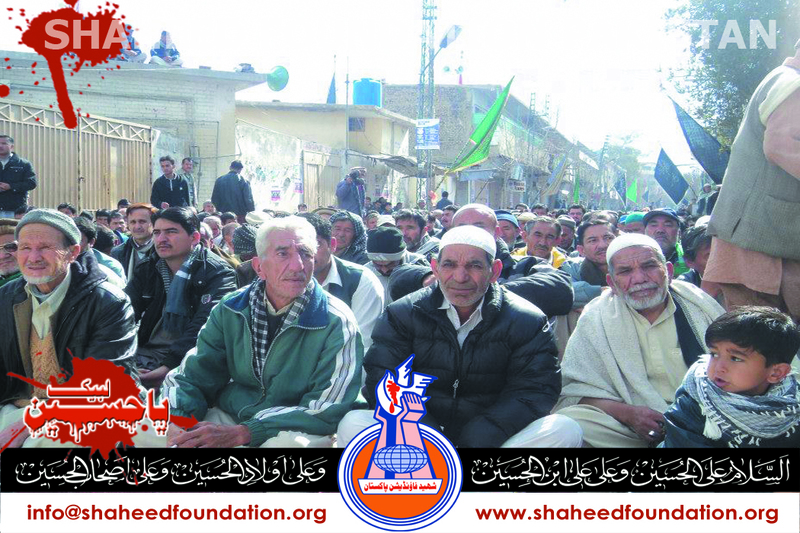 Chehlum program of Alamdar road Shohada of 10th Jan begun here at the same place on scheduled time. 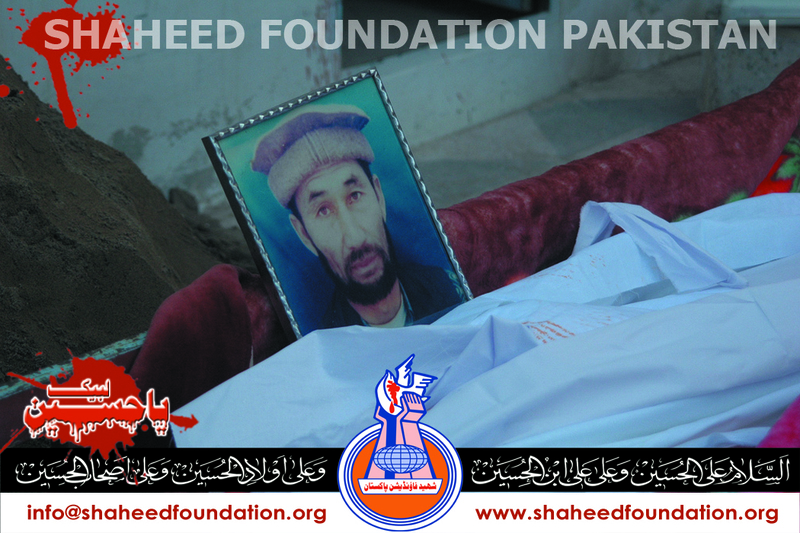 Shohada`s remembrance always takes place howsoever tough the situation becomes . Shaheedo Zindabad! Important announcements are likely to be made in the program in wake of the yesterday`s gruesome incident of terrorism which resulted in a large number of Casualties . 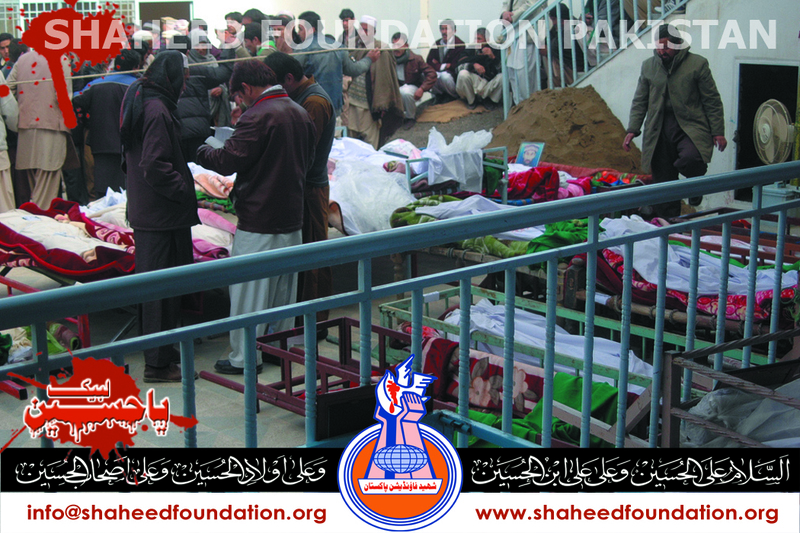 A total of Seventy Shohada have been identified yet ,several still are missing and believed to have been martyred as some un-identified limbs /body parts have also been found ,180 are injured as confirmed yet . In provincial capital the national flag has been flying at half mast to mourn the tragedy and three days of mourning had been announced earlier. Heartfelt condolences to Imam-e-Zamana(a.t.f.s) on this heart rending incident on the followers of Maula Imam-e-Zamana(a.t.f.s) . Millat vows and re-iterates its resolve to continue to follow the lofted path of martyrs with resilience ,vigour and fervour. 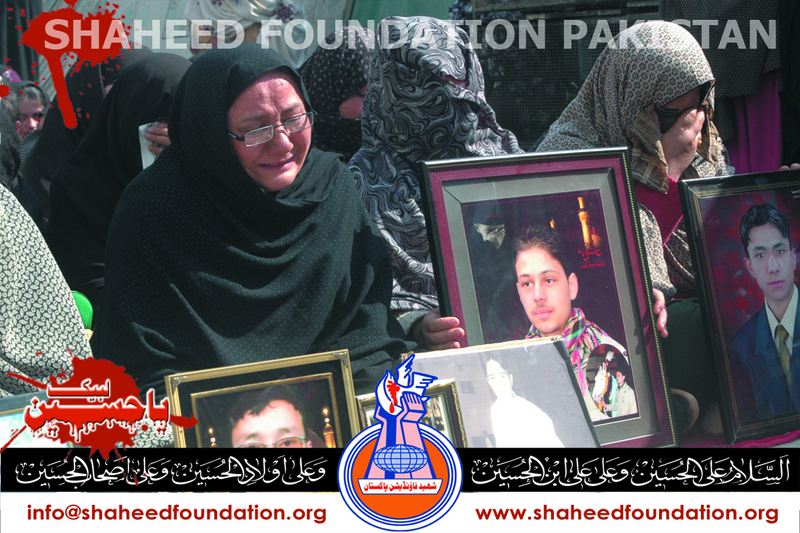 In Quetta ,the number of martyrdoms are feared to increase as a very large number of momineen are injured. 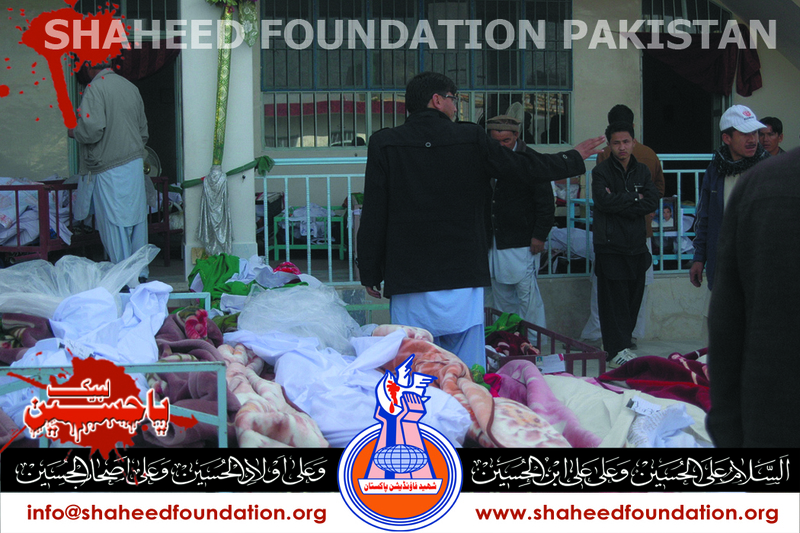 Only a month ago,95 momineen had embraced shahadat and 190 were injured consequent to twin blasts at Alamdar Road Quetta. 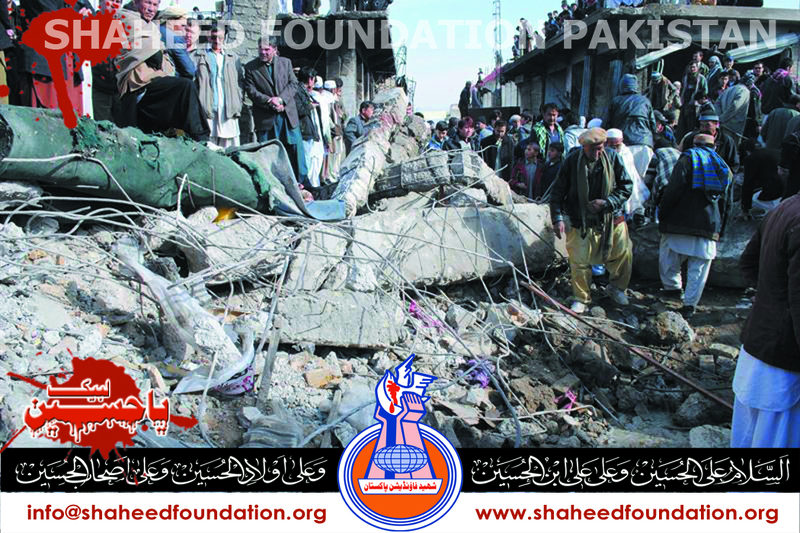 Yesterday`s blast took place in a pre-dominantly shia strong hold namely Hazara town when yazidi terrorist/(s) were able to detonate a water tanker packed with one thousand kilogram of explosives in the busy market area resulted in a very large number of casualties which are feared to increase . 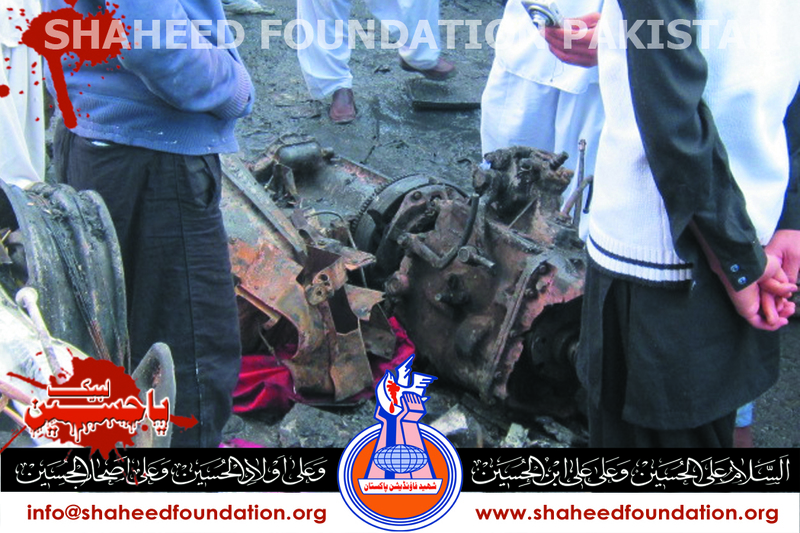 The blast was triggered through a remote controlled device ,the Deputy Inspector General of Police was quoted as saying. 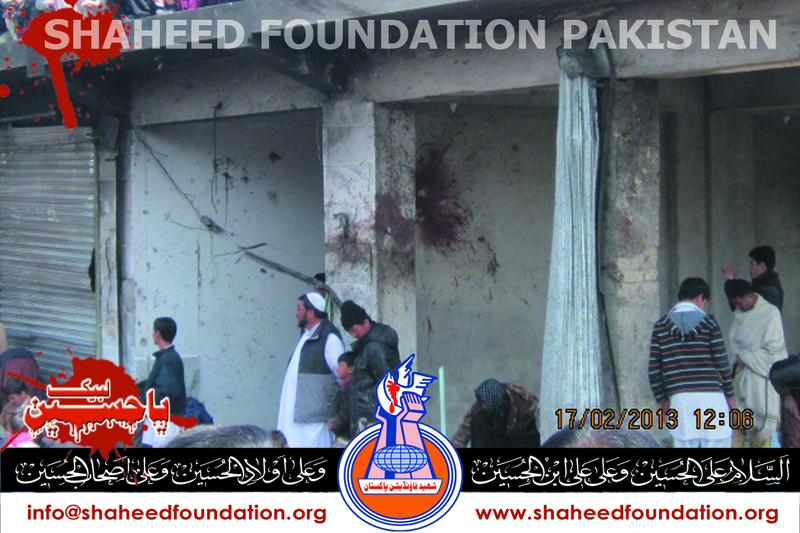 In Balochistan the national flag will flutter at half mast to mourn the gruesome tragedy . The blast was so powerful that it left a crater six feet deep and fourteen feet wide on the point of impact. In a hurriedly called press conference in Lahore ,Ulema-e-Karam termed the event as have been orchestrated by the same people who had been behind the formation of yazidi entity of taliban . It has been announced that a protest will be held at Lahore`s governor house at 1pm and Zohrain prayers will be collectively offered. Country wide protests have been planned for sunday with protests to be held in all major towns including Multan, Dera Ghazi Khan Khan,Gujranawala , Jehlum ,Rawalpindi ,Islamabad,Sheikhupura,Gilgit Baltistan ,Sialkot as well as all major cities of Sindh . 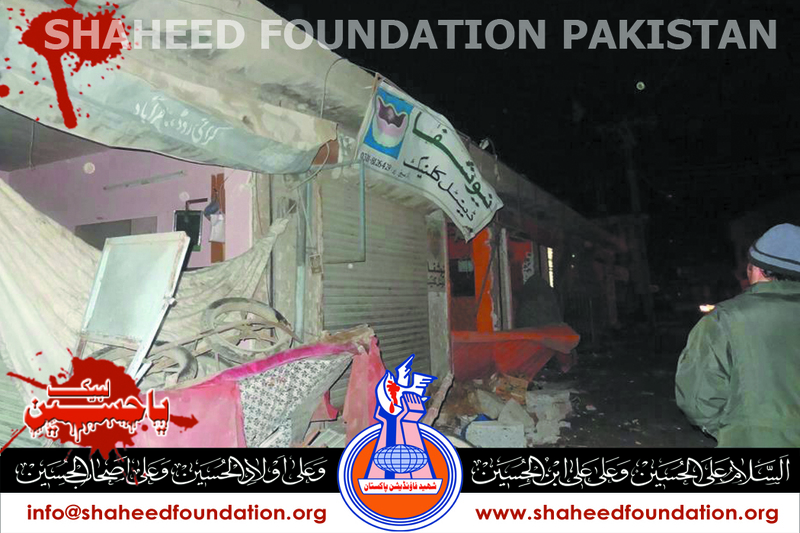 Also the main focus of the Jhang program organized by Tehreek e Bedari Ummat e Mustafa is expected to remain on the situation of Quetta too ,among other issues facing Millat. 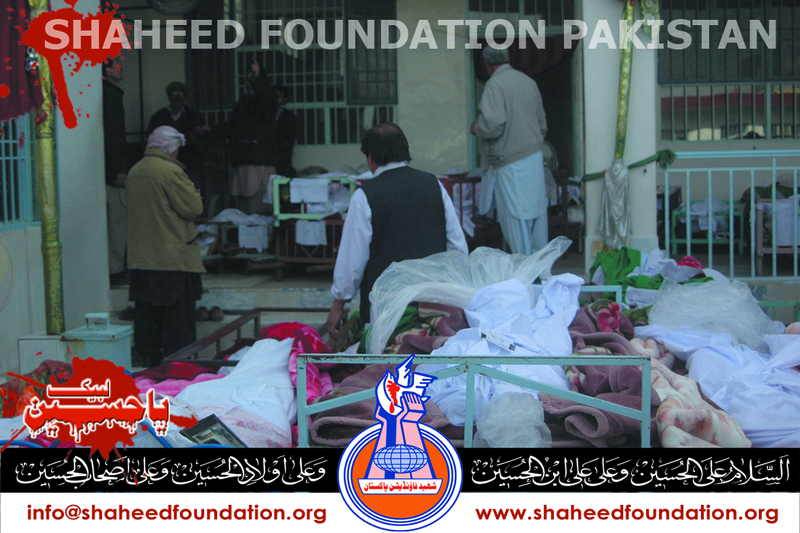 Moving scenes were being witnessed in the hospitals as momineen kept turning up in search of loved ones . 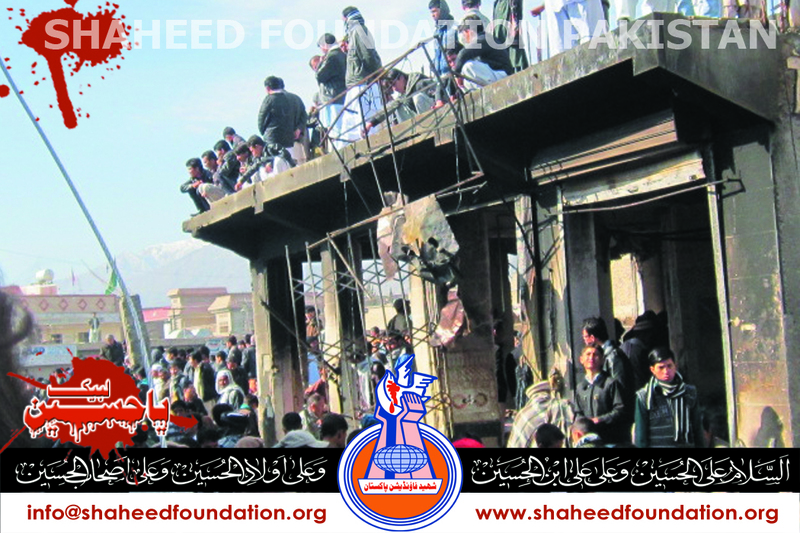 Till late in night Ulema e Karam were busy in intense consultations as they had been in provincial capital already to commemorate the fortieth day of martyrdom of 10th Jan tragedy of Alamdar Road Quetta and important announcements regarding the course of action is likely to be announced in the chehlum program which is scheduled to be held at Alamdar Road today at 10 am . 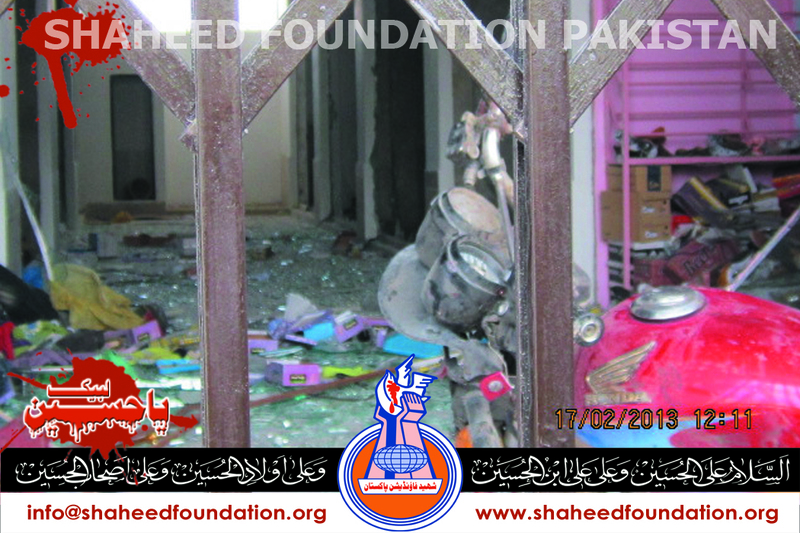 Majlis Wahdatul Muslimeen has announced to observe strike and the call was ably endorsed and backed by Imamia Students Organisation,Jafaria Students Organisation,Shia Ulema Council , Jaffaria Alliance Pakistan and many different organizations and institutions of Millat-e-Jaffaria Pakistan . 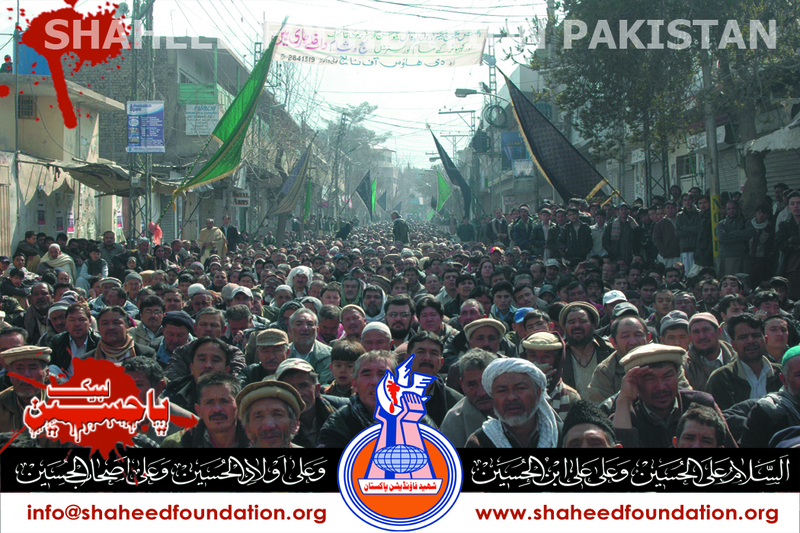 Shia Ulema Council vowed to endorse the collective efforts and protests mobilisation were underway right across the country. 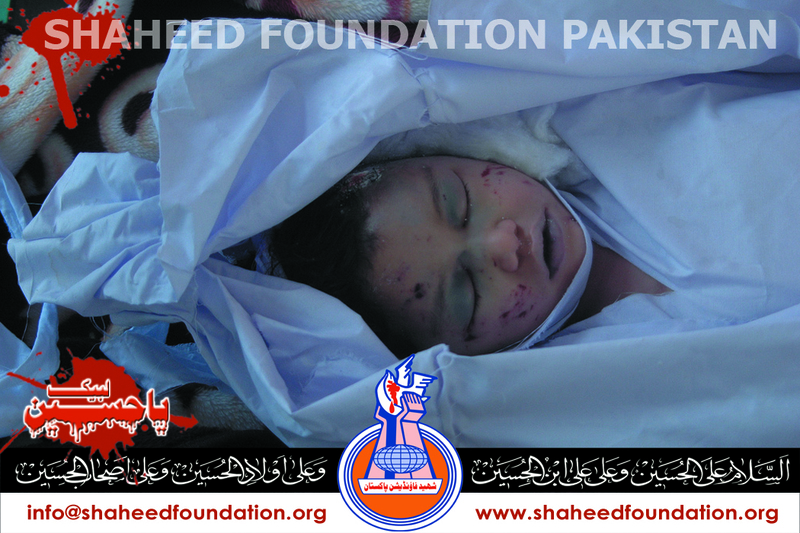 Sixty martyrdoms have been confirmed yet and 150 + momineen are believed to be injured. A powerful blast has rocked on Kirani road targeting momineen, it was learnt shortly. Several casualties are being reported including women and children. 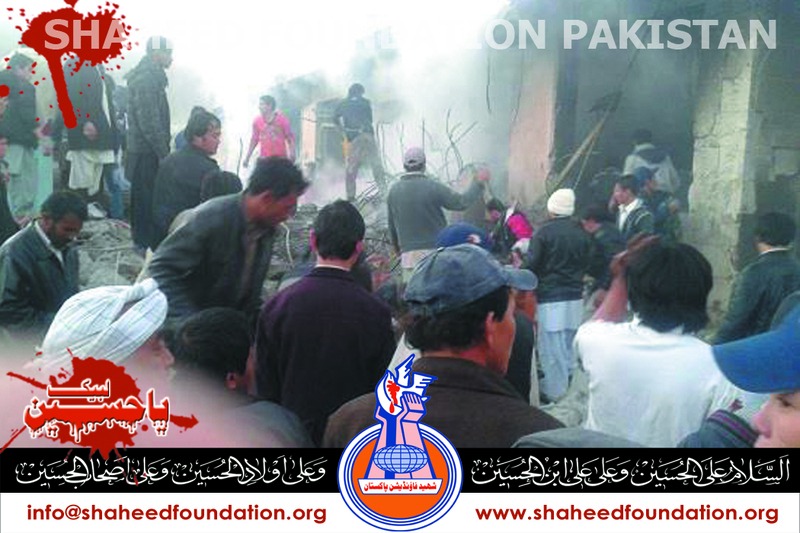 Sunday [Tomorrow] marks the Chehlum of Shohada of twin blasts of 10th Jan on Alamdar Road and momineen from various parts of Pakistan had on-verged in Quetta to express solidarity with Khanwada-e-Shohada. 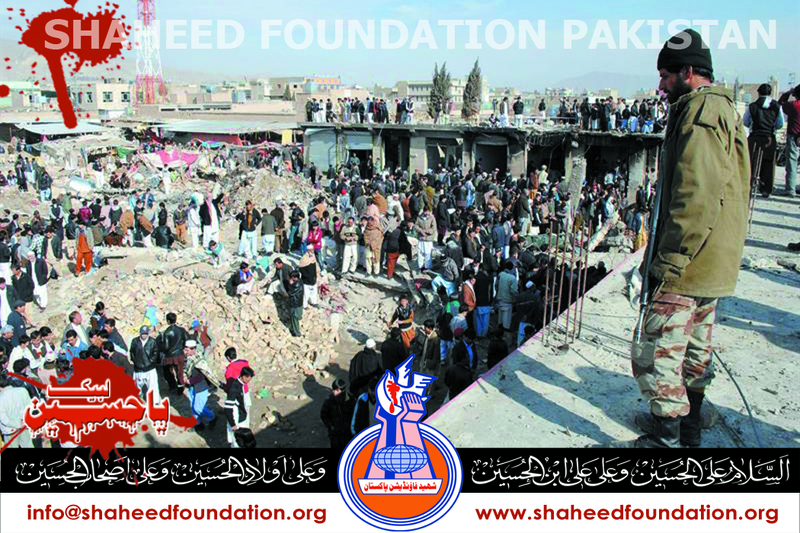 Enemy has made a very very deadly mistake by resorting to such a coward action at such a crucial time when the preparations are underway right across various parts of the country and the entire world to commemorate the fortieth day of the martyrdom of the victims of Shohada-e-Alamdar Road Quetta. The gruesome tragedy resulted in 95 martyrdom and 190 injured on 10th Jan 2013.and worldwide protests resulted in ouster of the yazidi CM. Enemy must be made to realize its foolishness in choosing the time of this attack and only the collective wisdom and resolve of every one in millat can ensure this. 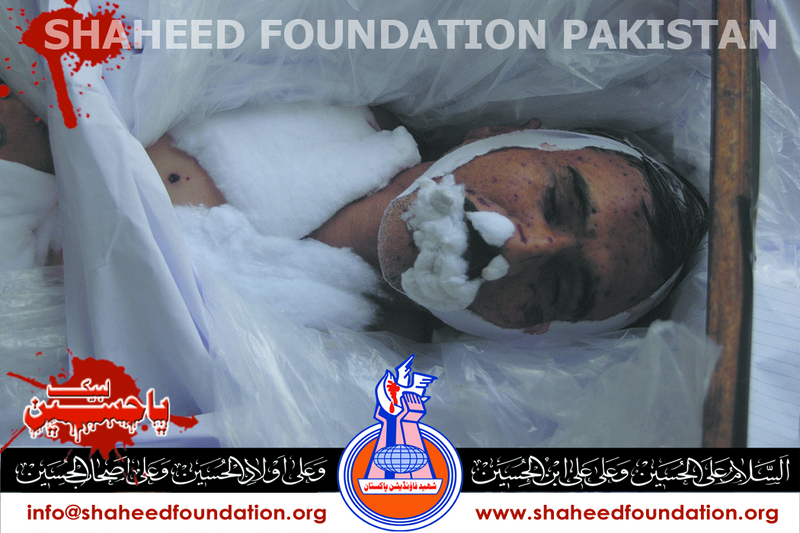 Inshaallaah the shohada of Quetta`s blood will stamp the ultimate victory of Millat-e-Jaffaria Pakistan inshaAllah and the forces of evil and terrorism, all their patrons in all organs alongside their takfiri and liberal tools and imperial masters, all will have to go packing from the pure land of muslims of Pakistan which has been established and strengthened with the blood of thousands of martyrs of Millat-e-Jaffaria Pakistan.